The new version of COMSOL Multiphysics® introduces new features and products including the Application Builder that promises to revolutionize simulation as we know it. Save models as specialized applications for use throughout your organization. 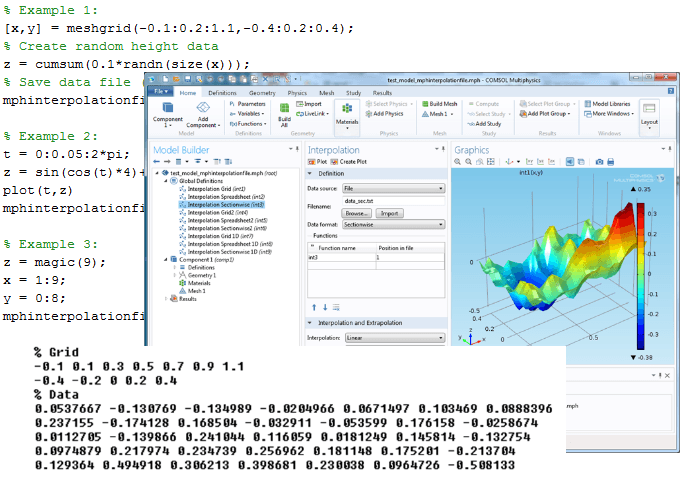 Design applications using drag-and-drop tools, in the Form Editor, or by programming using the Method Editor. 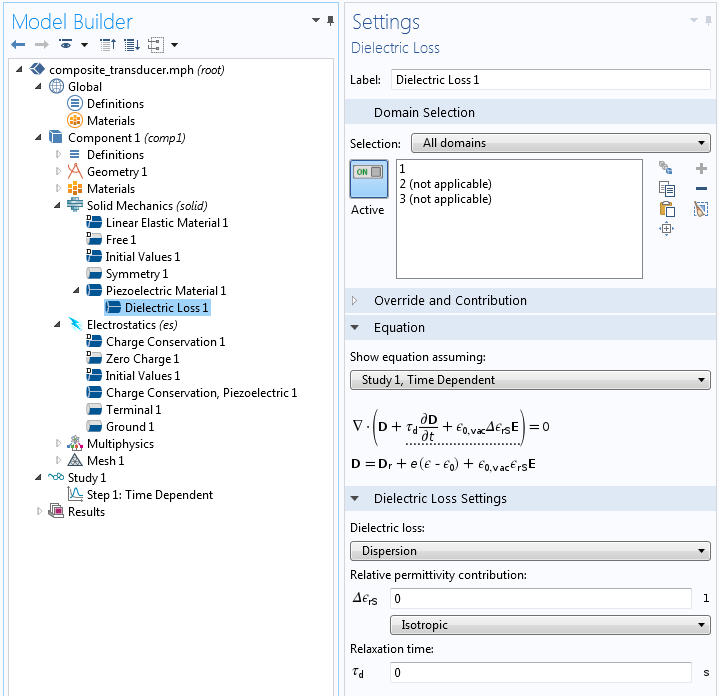 Include specific features from the model or introduce new ones through programming using the Method Editor. 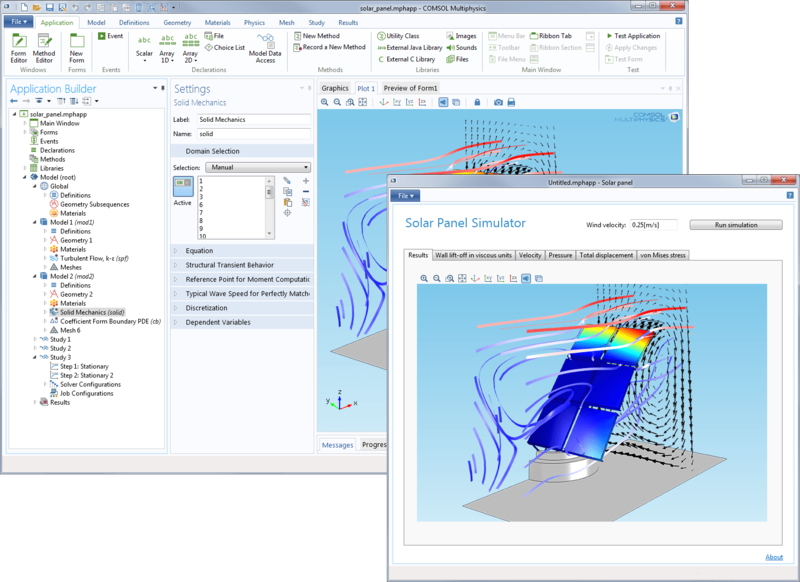 Run applications on COMSOL Multiphysics or COMSOL Server™ using either an installed or web-based client. 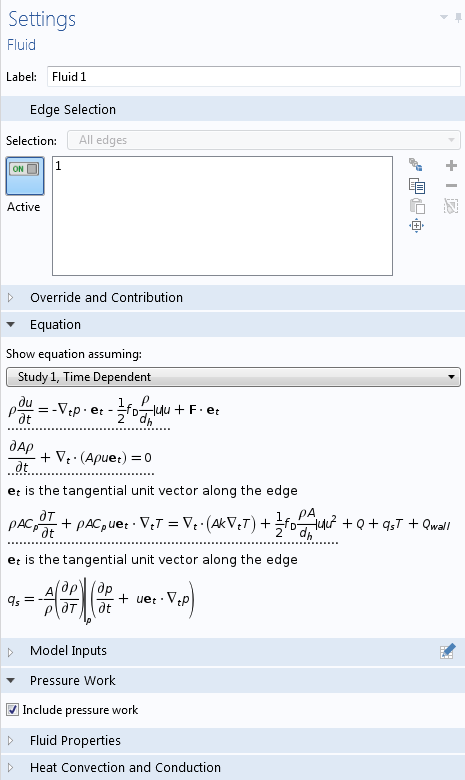 Application Builder: A fluid and structural analysis of a solar cell panel. The application allows the user to change the wind settings and re-solve the model. Then, they can investigate some of the fluid dynamics and structural properties. Convert an imported mesh into a geometry object. 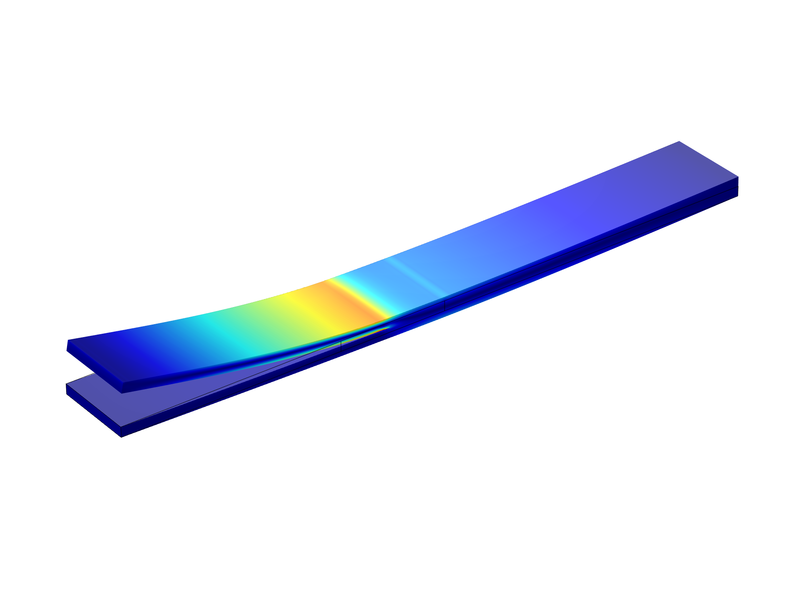 Use solid operations on an imported mesh of a mechanical part for use in, for example, flow or electromagnetics simulations. 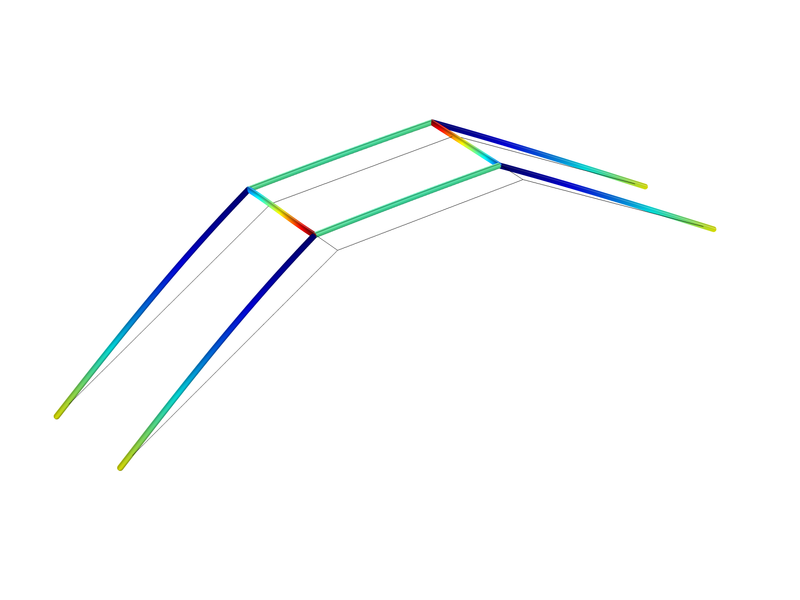 Create a library of geometry subsequences in an MPH-file and link to them from a model. Useful for organizing geometry objects. A new copy-mesh operation allows you to copy a mesh from a meshing sequence belonging to a different model component. Fast solid operations enable easier modeling of devices with large geometry arrays, such as touch screens and MEMS accelerometers. Geometry from Mesh: Create geometries from an imported mesh, and perform Boolean operations such as "Difference". 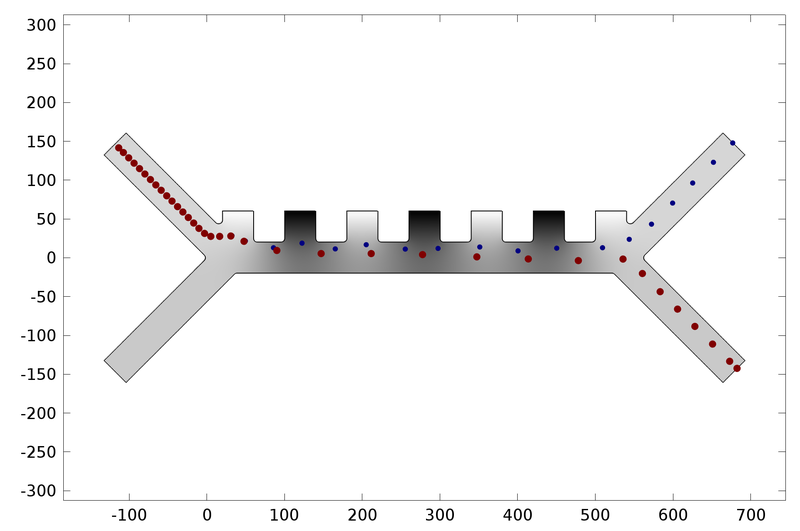 The results are seen in a mesh plot. A new solver algorithm enables extremely fast meshing and solving of CAD assemblies where hanging nodes are allowed and approximate answers are sufficient. Add abstract geometrical dimensions to your model for multiscale simulations. Search for eigenfrequencies within a given interval or complex-valued region by inputting the desired number of frequencies. 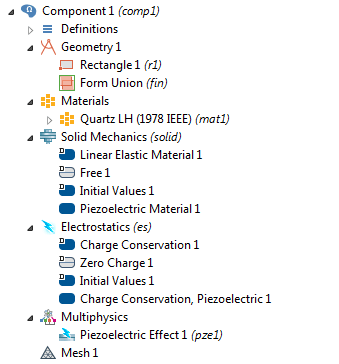 Create a library of materials that are common to model components and link to them with the new Material Link feature. 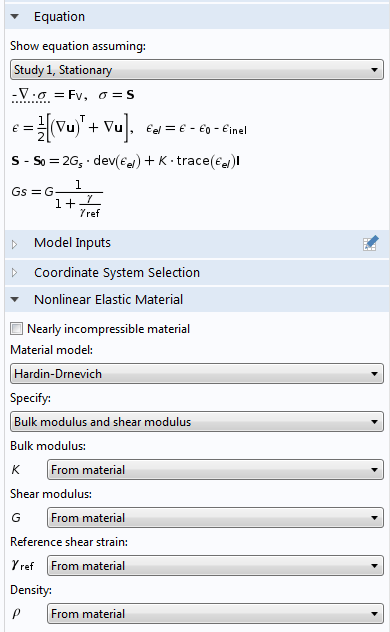 Use the new Switch feature to define parametric sweeps over a discrete set of materials or user-defined functions. Associate a unit with a parameter used in a parametric sweep. Using probes to track and plot quantities while solving is now more efficient and adds less computational overhead than in earlier versions. 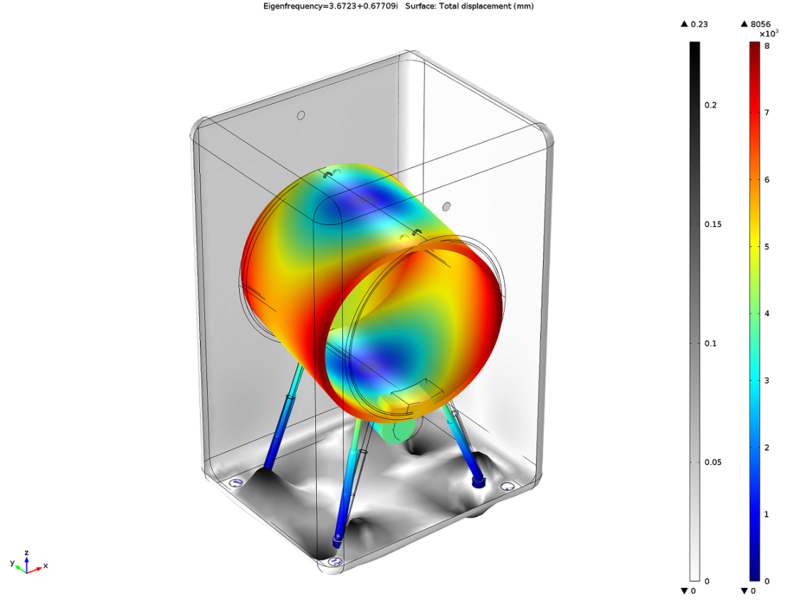 Simulation of CAD assemblies: Vibrational analysis of a fan assembly. 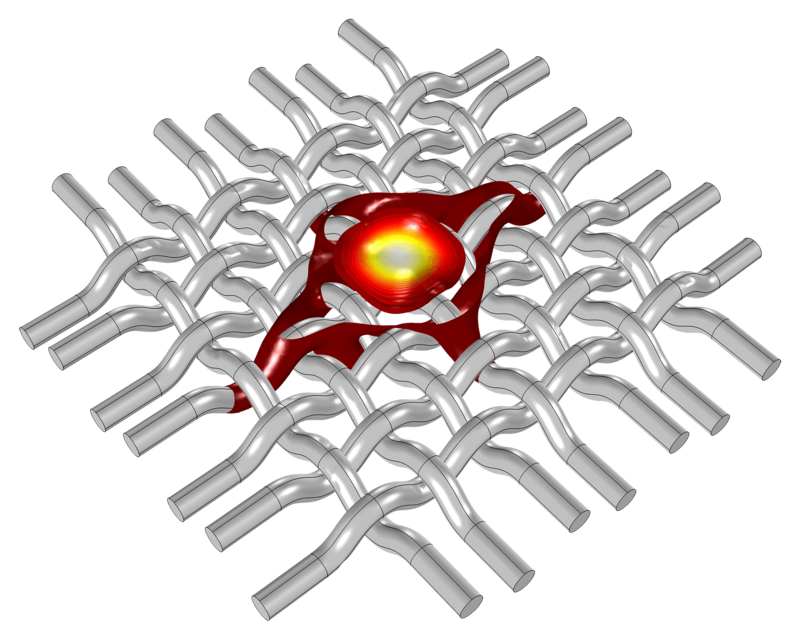 Non-conforming meshes with "hanging nodes" use swept meshes in all domains, resulting in a mix of hexahedral and prism elements. The Spectrum color table includes violet and richer shades of green to more closely replicate the human perception of visible light. You can select from the options no view scaling, automatic view scaling, and manual scaling, where you can manually set the view scale factors in the x-, y-, and z-directions. You can plot contour lines as tubes in a way similar to the current functionality for streamlines. The x, y, and z data values can be scaled and translated to better match the values of other data sets. In tables, you can select a column and right-click to copy that column, with or without its header, to the clipboard. You can also select and copy the contents of a single table cell. You can now edit table headers. When a table is imported from file, the headers are taken from the last comment row preceding the data. Spectrum Color Table: The new Spectrum color table (bottom) compared to the Rainbow color table (top). The new table gives more emphasis on the violet and green parts of the spectrum, making it a more accurate representation of the human perception of wavelengths in the visible spectrum. 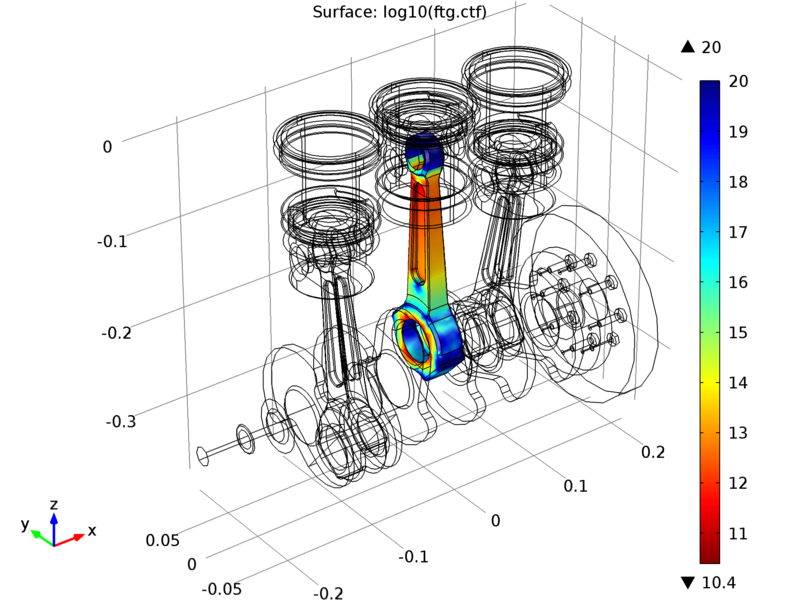 Dedicated Multiphysics Nodes: Model and application of a shell-and-tube heat exchanger built using the dedicated multiphysics node for Non-Isothermal Flow. An app has since been made of the model that will always solve this multiphysics coupling when it is run. For modeling systems where the electromagnetic wavelength is smaller than the surrounding geometry. Treats electromagnetic waves as rays, which propagate through homogeneous or graded media where reflection and refraction at boundaries can be considered. Release rays from boundaries and within domains as well as utilizing specialized release features for modeling solar radiation and reflected or refracted rays from an illuminated surface. Utilize specific postprocessing tools to analyze ray trajectories, evaluate expressions over many rays, and visualize interference patterns. Couple ray tracing physics to other physics such as structural stresses and heat transfer. Newtonian Telescope: Simulation of a Newtonian telescope that uses a parabolic and a flat mirror for reflection. Results show the ray trajectories as they travel through the telescope and are reflected into the focal plane. The physics-controlled auto mesh suggestion automates meshing for periodic conditions. The new auto-mesh suggestion automatically applies swept (3D) or mapped (2D) meshing to domains with infinite elements. 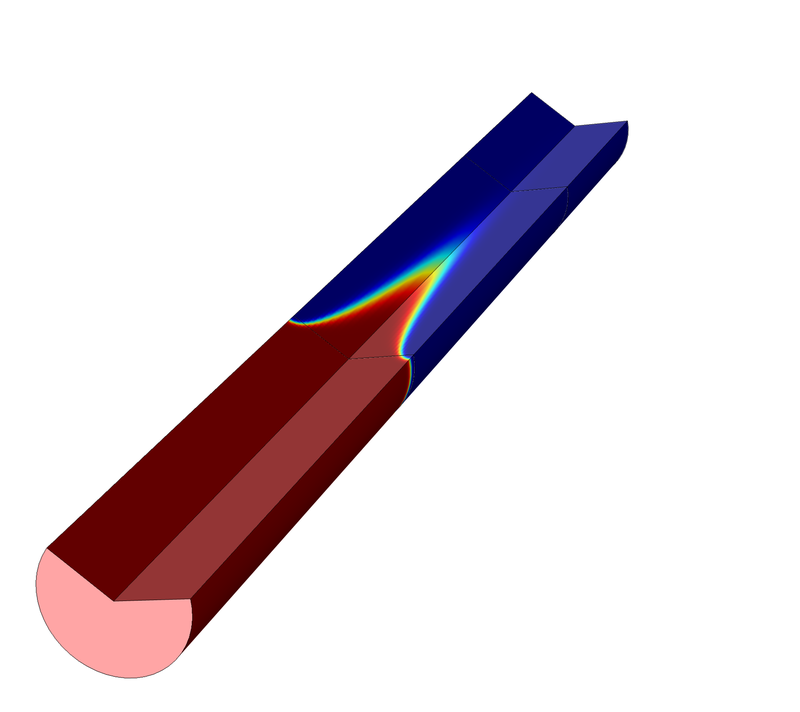 You can now include dielectric loss and loss tangent material models in electric currents simulations, as well as power terminal excitation. Automated meshing for infinite elements: This model simulates a power inductor using the automated meshing for infinite elements feature. Before solving, you now have the option of automatically scaling your mesh with respect to the material properties in order to resolve the local wavelength. The new auto-mesh suggestion automatically applies swept (3D) or mapped (2D) meshing to domains with perfectly matched layers (PMLs). 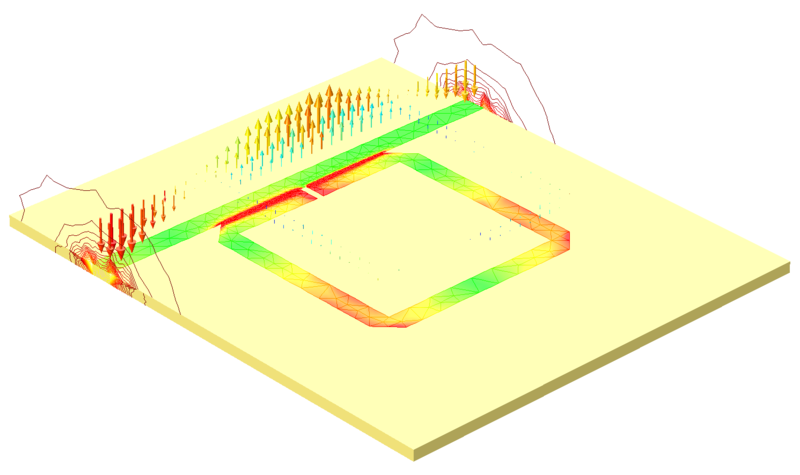 The RF Module now includes a Numeric TEM port feature for transmission lines. 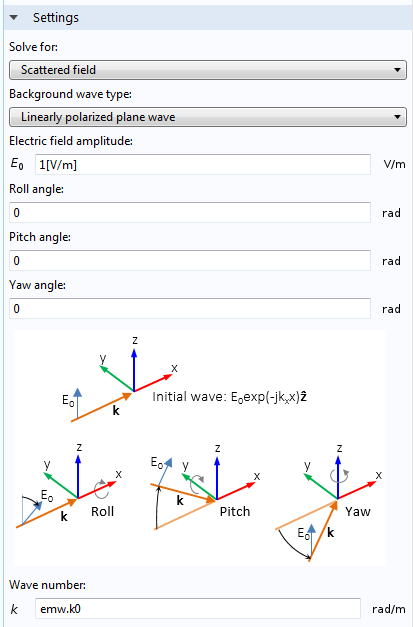 The Wave Optics Module now includes a new background field option for linearly polarized plane waves. 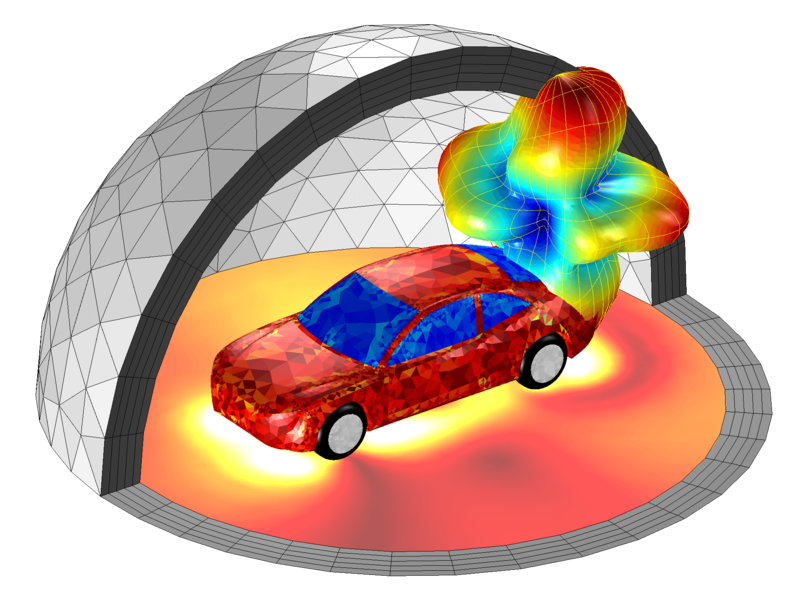 Automated meshing for perfectly matched layers: This model simulates an FM antenna printed on the rear windshield of a vehicle. The simulation computes the far-field radiation pattern of the antenna and the electric fields on an interior cable harness. The automated mesh feature allows for a one-click definition of the perfectly-matched layer. The same can also be utilized for periodic boundary conditions. The Piezoelectric Devices interface has been replaced by the new Multiphysics node, Piezoelectric Effect, which couples the Solid Mechanics interface with the Electrostatics interface. 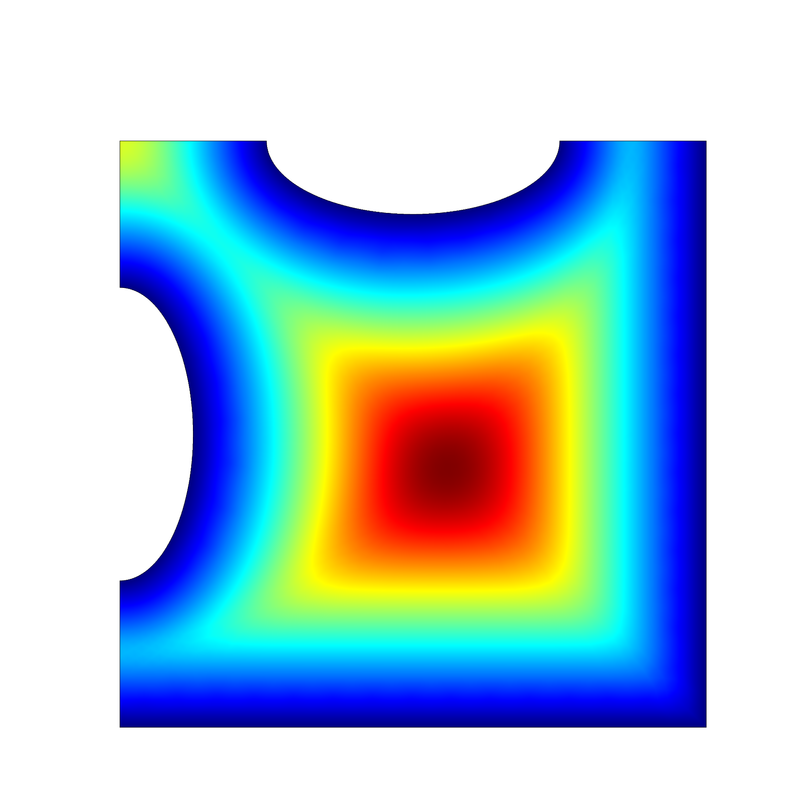 The new Dielectric Loss option for the Piezoelectric Effect Multiphysics node allows for the modeling of electrical losses in both the time domain and the frequency domain. 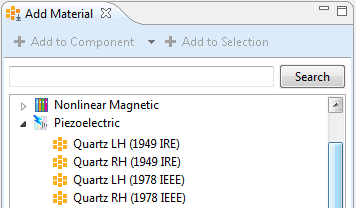 New material properties are now available for modeling the piezoelectric properties of quartz to support both left-handed and right-handed polarized material, as well as the two standards commonly used for defining the material properties: 1949 IRE and 1978 IEEE. The Model Library now includes a model for a surface micromachined accelerometer. Surface Micromachined Accelerometer: Simulation of surface micromachined accelerometer, modeled using the Electromechanics interface. The Dielectric Contact boundary condition is used for boundaries that represent a dielectric material in contact with the plasma, and it allows for a bias voltage to be applied on the back side of a dielectric material without the need to include the dielectric material in the geometry. The Metal Contact boundary condition can be driven with a fixed current or an external circuit in addition to an electric potential, and can result in a more stable system and more robust convergence. The Terminal feature has been improved and it is now possible to drive the terminal with a fixed current, making it possible to compute the DC bias on a capacitively coupled plasma (CCP). 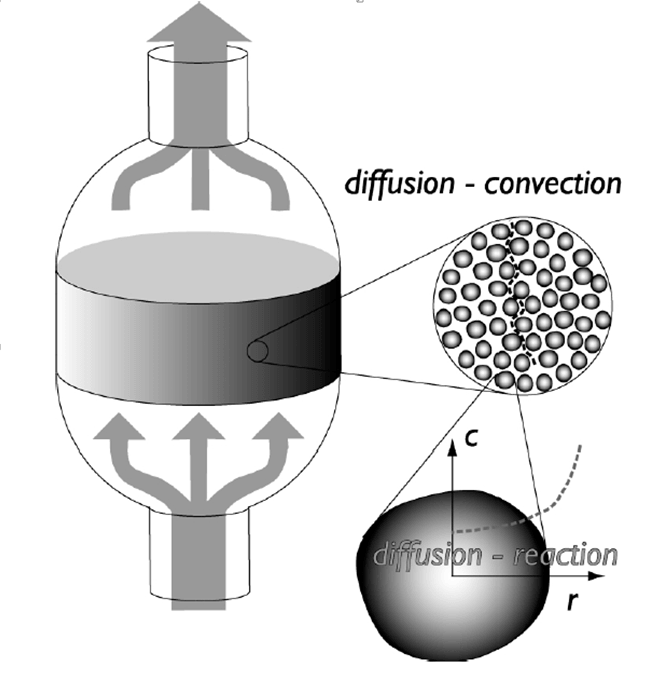 ICP TORCH: Model of an inductively coupled plasma torch. Simulation results reveal electrical and thermal characteristics of the torch at atmospheric pressure. The Semiconductor Doping Model feature has been replaced by two new features: the Analytic Doping Model and the Geometric Doping Model features. The Semiconductor Initialization study makes it possible to refine a 2D mesh in regions where the dopant concentration varies rapidly. Two new interfaces—the Semiconductor Optoelectronics, Beam Envelopes interface, and the Semiconductor Optoelectronics, Frequency Domain interface—enable the modeling of bulk, direct band-gap semiconductors interacting with optical fields. A new model of the GaAs PIN Photodiode demonstrates the new Optoelectronics interfaces. For modeling of direct band-gap materials, spontaneous emission is accounted for in the new optoelectronics interfaces. In the new optoelectronics interfaces, the change in the complex permittivity, or refractive index, of a material due to light absorption can be calculated and used to amend the propagation of electromagnetic waves through the material. Two boundary conditions-Insulator Interface and Floating Gate-make it possible to model tunnel currents through insulating barriers and the accumulation of charge on floating gates. A new model of an Electrically Erasable Programmable Read-Only Memory (EEPROM) device demonstrates the use of these boundary conditions. Detailed modeling of traps is made possible by the new Trap-Assisted Recombination and Explicit trap distribution features. A new model shows how to model surface traps on a gate all around MOSFET device created from a silicon nanowire. The Semiconductor Material model includes two new models for band-gap narrowing: The Slotboom model and the Jain-Roulston model. The New Geometric Doping Model feature: The concentration decays with a Gaussian profile with increasing distance from the left-hand edge of the domain. This demonstrates how curved boundaries can be accommodated. Automatic Mesh Refinement: The Semiconductor Initialization study is used to perform automatic mesh refinement around the doping concentration in the bipolar transistor model. The color map shows the dopant concentration, and the mesh density has been increased in areas with a large concentration gradient. Optoelectronics physics interfaces: Here the new GaAs PIN photodiode model is shown. This model is built using an optoelectronics physics interface to easily enable coupling between the Semiconductor and the Wave Optics interfaces. The Semiconductor interface calculates changes in the refractive index due to absorption, and the Wave Optics interface calculates the intensity and propagation of the incident light. 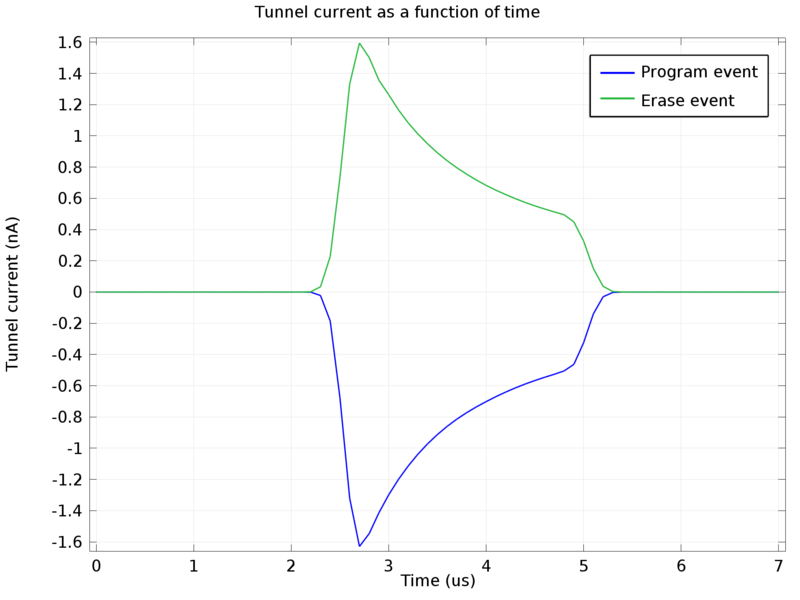 Tunnel currents: Tunnel current flowing during the program and erase events for an Electrically Erasable Programmable Read-Only Memory (EEPROM) device. Thin layers can be challenging to model when the aspect ratio between the whole geometry and the layer's thickness is large. 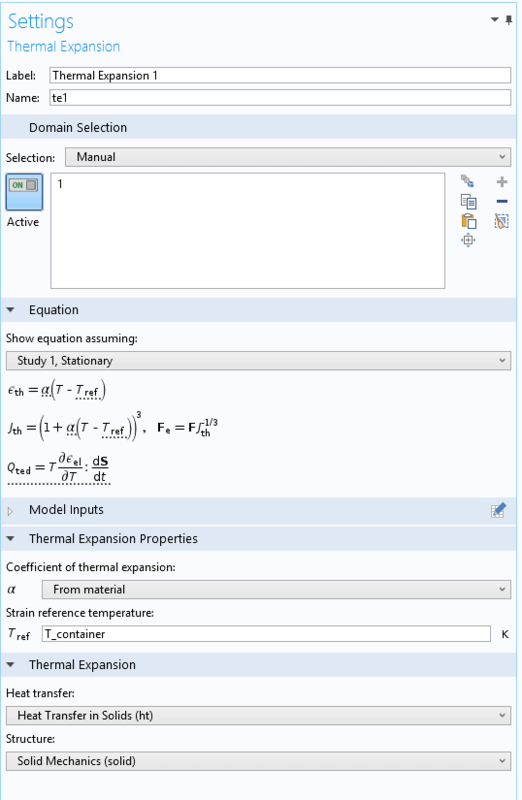 The new Thin Layer feature provides options for cost-effective lumped models to represent thin layers when they are either acting as a thermal resistance (e.g. as an air gap between two metal parts) or as a highly conductive layer (e.g. a copper layer on a PCB). A third option is available for the general case where no particular assumption is made, so the full heat transfer equations are solved on the layer. In this case, a dedicated mesh is automatically generated for the layer without adding any complexity to the geometry meshing process. This feature utilizes the new core technology for modeling extra dimensions. The new Thin Film feature models heat transfer in thin fluid regions. Using the Thin Film feature prevents the fluid film from being represented explicitly in the geometry, and provides a lumped model for heat transfer for cost-effective modeling. The Thin Film feature provides dedicated settings to define the thermal properties of the fluid, as well as the flow properties. This feature utilizes the new core technology for modeling extra dimensions. 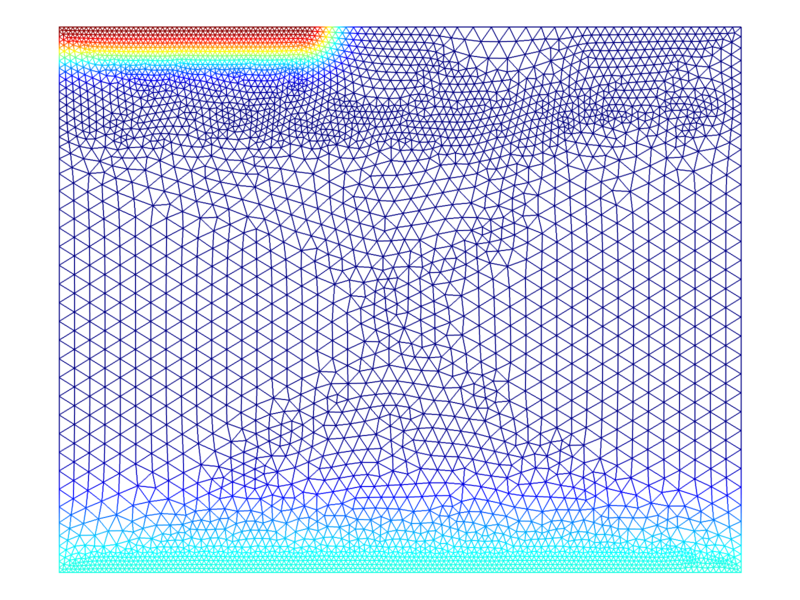 The new Fracture feature models heat transfer in fractures as a thin porous medium. Using the Fracture feature prevents the fracture thickness from being represented in the geometry, and provides a lumped model for cost-effective modeling. 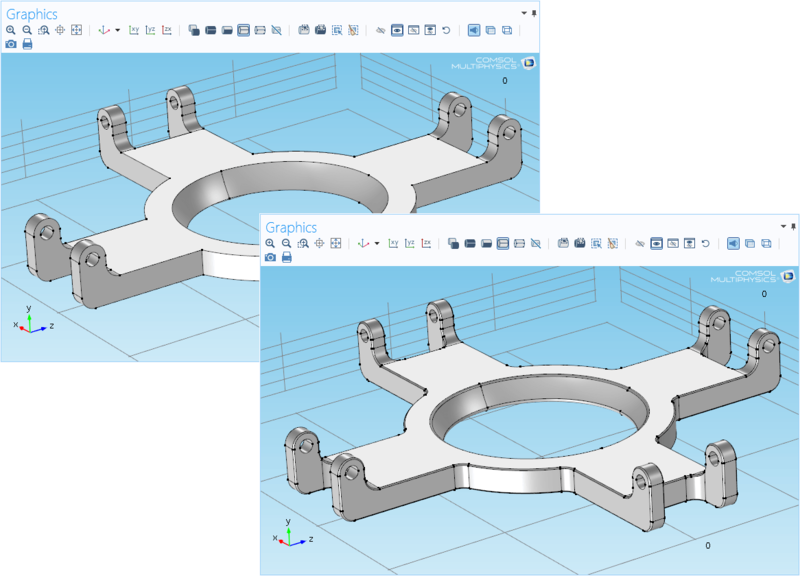 The Fracture feature provides dedicated settings for defining the fluid and solid parts, as well as the flow properties. The flow can be defined by a flow interface, such as by the Fracture Flow interface, for example. This feature utilizes the new core technology for modeling extra dimensions. 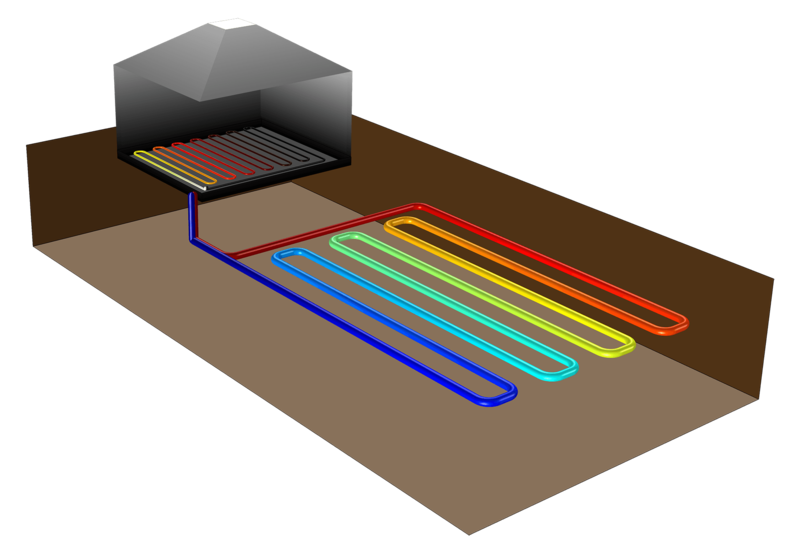 Ground Heat Recovery: Ground heat recovery is an energy efficient method to supply houses with heat, where heat collectors exist in a subsurface environment. This model compares different patterns embedded in the subsurface with typical thermal properties of an uppermost soil layer in a garden. Evaporation: This model simulates the heating and cooling of water in a beaker with and without phase change. A mass balance is added to include the effect of evaporation. When a solid with low thermal conductivity contains rods made of a highly thermally conductive material, such as concrete containing reinforcing steel, the heat transfer contribution of the rod cannot be neglected. However, representing the rods as narrow domains in the geometry is usually not reasonable because of the aspect ratio in the geometry and the induced meshing cost. 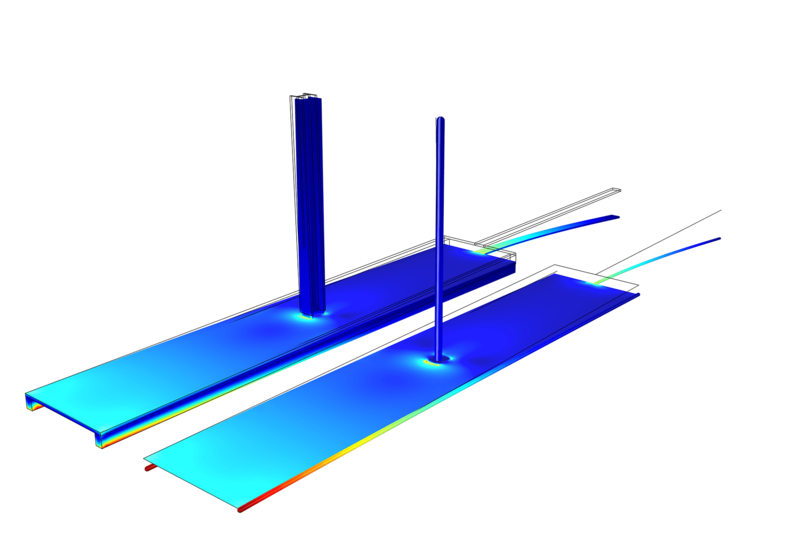 The new Thin Rod feature provides a lumped heat transfer model to model highly thermally conductive rods as edges. 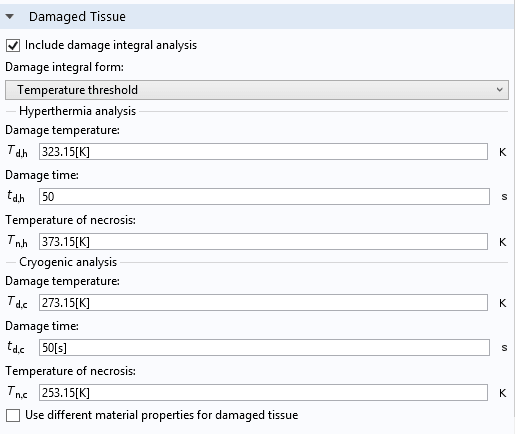 The Temperature threshold form for damage integral analysis in the Biological Tissue feature now provides options to perform cryogenic analyses. Two temperature thresholds can be defined: One is the temperature below which the damage occurs progressively, and the second (lower) temperature is the threshold below which tissue necrosis occurs. Fan, Interior Fan, and Grille features have been updated so that turbulence models are also supported. These features provide lumped models that replace an explicit device description by a boundary condition. For example, the Fan boundary condition uses fan curves to determine the pressure drop through the device and also sets the appropriate conditions for the other dependent variables. When a non-isothermal flow coupling feature is used, the mixing effect of the temperature field at the fan outlet is included. 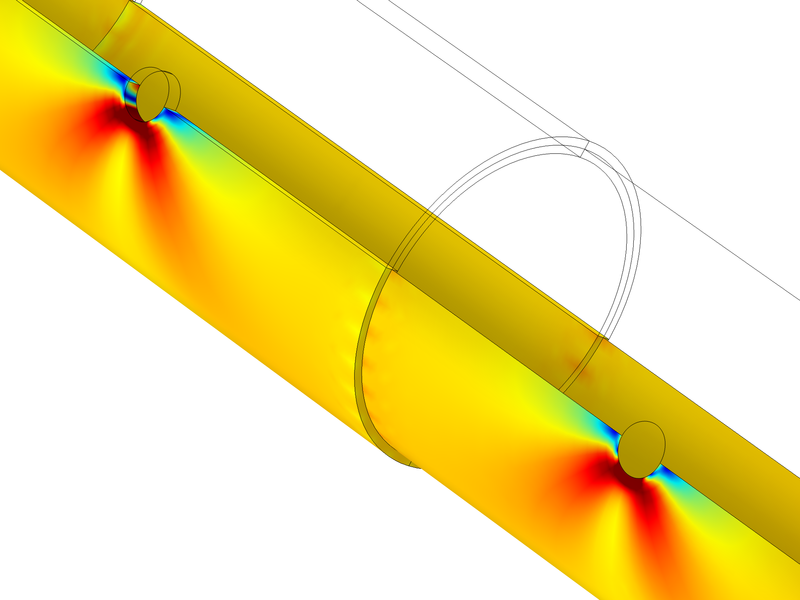 The new Viscous Dissipation feature extends the capabilities of the COMSOL software to model viscous losses in flows. It is available for heat transfer in free flows and in porous media, and the viscous dissipation contribution is synchronized with the flow properties (free or porous media, flow regime, and model). 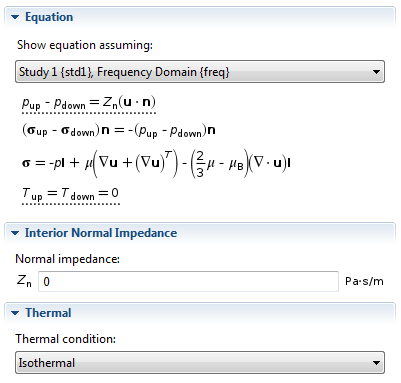 The new Isothermal Domain feature can be used to model regions where the temperature is assumed to be homogeneous. Instead of solving the temperature field for heat transfer, a global heat equation is used to determine the domain temperature as a constant value throughout a domain. The Isothermal Domain feature is compatible with most of the classical domain, boundary, edge, and point features. Nevertheless, a new dedicated boundary condition has been introduced to set global conditions on isothermal domains. The Isothermal Domain feature provides options to define thermal insulation, convective heat flux, thermal contact, or ventilation between two isothermal domains. 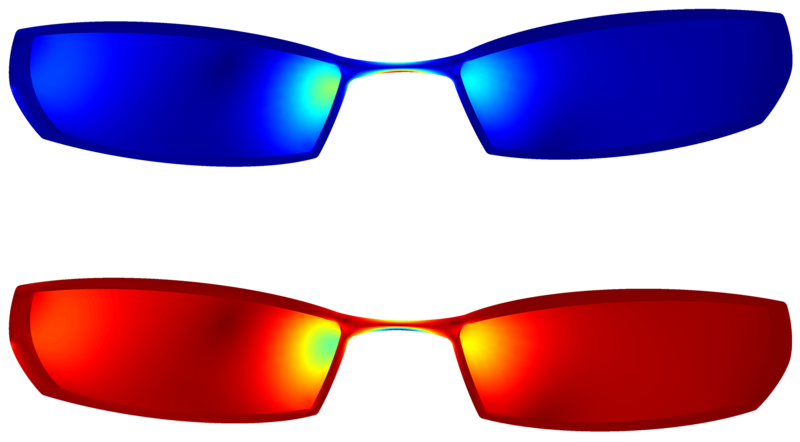 In order to reduce the computational cost of conjugate heat transfer models, the natural convection mixing effect in cavities can be modeled from a thermal point of view as an immobile fluid with a larger thermal conductivity. With this approximation, it is not necessary to compute the flow in the cavities. The Nusselt correlations provide two configurations: parallel-piped cavity with both horizontal and vertical temperature gradients. An option for user-defined correlation is also available. Participating Media: A glass melt is cooled down through radiation. The simulation is performed using the three radiation in participating media models provided in COMSOL Multiphysics to compare the accuracy and computational costs. 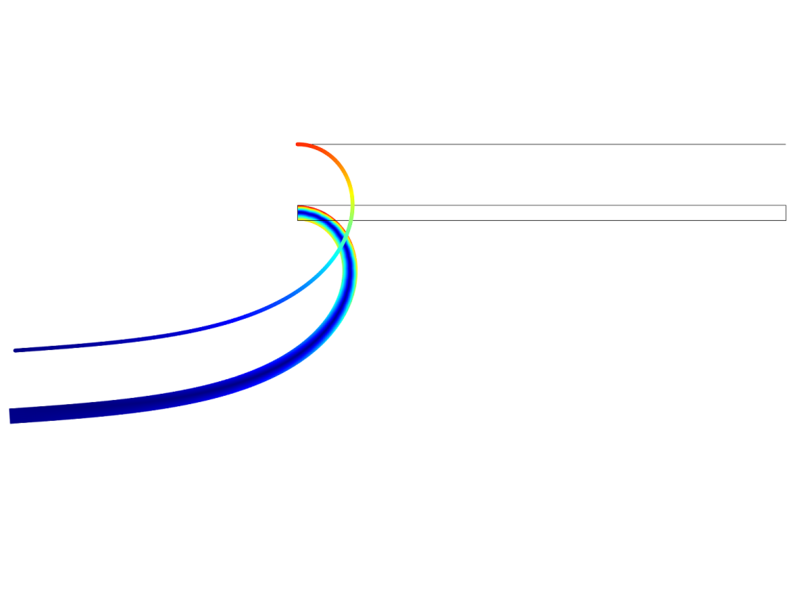 Curvilinear Coordinate Interface: This model shows how to model anisotropic properties of fibers in a heat transfer simulation. The fibers have high thermal conductivity in the fiber direction and low conductivity in the perpendicular direction. Because the fibers orientation is not easy to define explicitly, the curvilinear coordinate interface is used to define the fiber orientation. In models using surface-to-surface radiation with the sun as an external radiation source, a new option is available to automatically define the location parameters (latitude, longitude, and time zone) from a list of larger cities. In the Line Heat Source and Point Heat Source features, a new option allows you to specify the radius of the source. Doing so avoids having non-physical infinitely concentrated heat sources that lead to mesh-dependent solutions. The technology used does not require that the mesh element size matches the heat source radius: The heat source is handled even with coarse meshes. Furthermore, refining the mesh close to the source location leads to a stable solution matching the solution of the corresponding geometry, where the source would be represented by a domain instead of a point. Constant discretization order for the Discrete Ordinate Method is now available in the Heat Transfer in Participating Media and the Radiation in Participating Media interfaces. This low-order discretization speeds up the computation since it reduces the number of degrees of freedom. 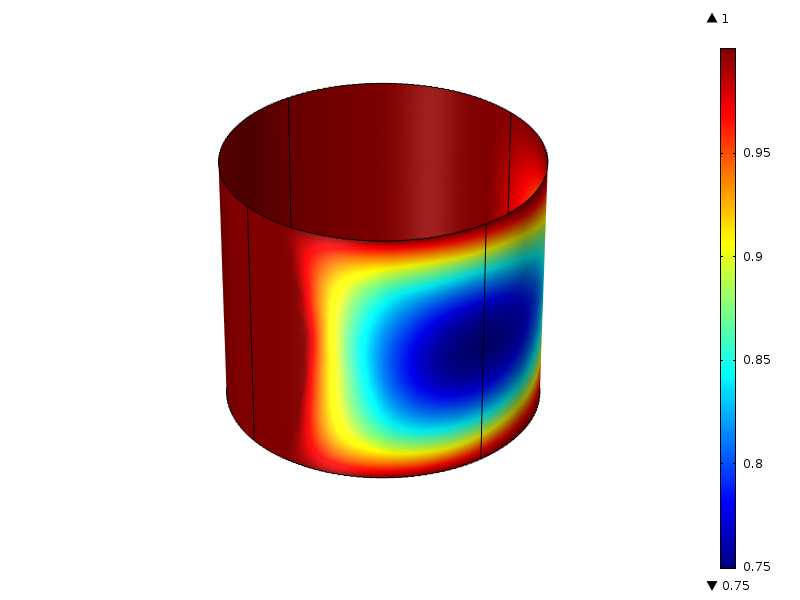 The new Thermoelastic Damping feature extends the capabilities of the COMSOL software for modeling the heating of solids due to the compression generated by vibrations. In particular, this feature accurately handles materials with a non-constant thermal expansion coefficient. 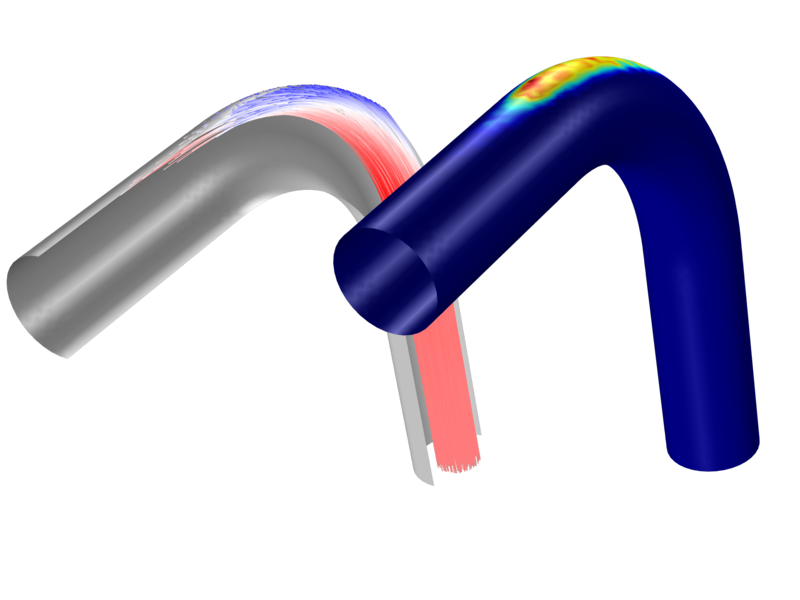 When using the Multiphysics node for Thermal expansion, the thermoelastic damping contribution is automatically taken from it. The built-in Material Library has been updated so that all materials available contain all the properties needed for thermal analysis. Several improvements have been added to the surface-to-surface capabilities. They cover computational performances, modeling capabilities, and postprocessing. The code used to compute the view factor for surface-to-surface radiation has been improved to support shared memory parallelization. Assembly time for surface-to-surface radiation models is now reduced when COMSOL Multiphysics has access to multiple cores. It is now possible to couple a domain interface and a shell interface that share the same temperature and radiosity fields (for example, the Heat Transfer in Solids interface can be coupled to the Heat Transfer in Thin Shells interface). This makes it possible to build surface-to-surface models containing shells and solids that are separated by a region (usually air or vacuum) that is represented in the geometry (not meshed). The heat transfer interfaces where surface-to-surface radiation is enabled provide a set of operators that are evaluated like the irradiation variables in surface-to-surface radiation. Thanks to these operators, it is possible to retrieve the irradiation variable's values, and also compute the geometrical view factor in a given geometry. New postprocessing variables enable irradiation variables at Gauss points to be plotted where they are defined. Doing so avoids unnecessary smoothing induced by Lagrange point-based plots and facilitates the analysis of such plots. New Multiphysics couplings and predefined Multiphysics interfaces replace and upgrade the existing multiphysics capabilities of the acoustics module. 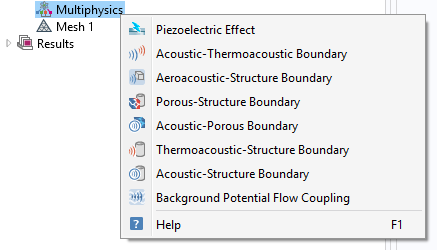 For example, coupling an acoustic fluid domain to a solid mechanics domain is now achieved by COMSOL Multiphysics adding an acoustics interface and a solid mechanics interface separately and then coupling them at the boundary using the new Multiphysics coupling node. This new formulation makes it possible to decouple the two contributing physics and gives access to all functionality of the acoustics interface and the functionality included in the solid interface (depending on the licenses). Acoustic-Structure Boundary for coupling the Pressure Acoustics interfaces to solid structures including Solid Mechanics, Shell (interior and exterior)*, Membrane*, and Multibody Dynamics*. Aeroacoustic-Structure Boundary for coupling Linearized Navier-Stokes, Frequency Domain to solid structures including Solid Mechanics, Elastic Waves, Shell (interior and exterior)*, Membrane*, and Multibody Dynamics*. Acoustic-Thermoacoustic Boundary for coupling the Pressure Acoustics interfaces to Thermoacoustics, Frequency Domain. Thermoacoustic-Structure Boundary for coupling Thermoacoustics , Frequency Domain to solid structures including Solid Mechanics, Shell (interior and exterior)*, Membrane*, and Multibody Dynamics*. Acoustic-Porous Boundary for coupling the Pressure Acoustics interfaces to a Porous Material domain from the Poroelastic Waves (or Elastic Waves) interface. Porous-Structure Boundary for coupling Solid Mechanics to Porous Material domains from the Poroelastic Waves (or Elastic Waves ) interface. Piezoelectric Effect connects a Solid Mechanics interface and an Electrostatics interface for modeling piezoelectric materials. Background Potential Flow Coupling for the one-way coupling of Compressible Potential Flow to the Linearized Potential Flow interfaces. Acoustic Ray Tracing: The acoustics of a small concert hall are simulated using acoustic ray tracing. 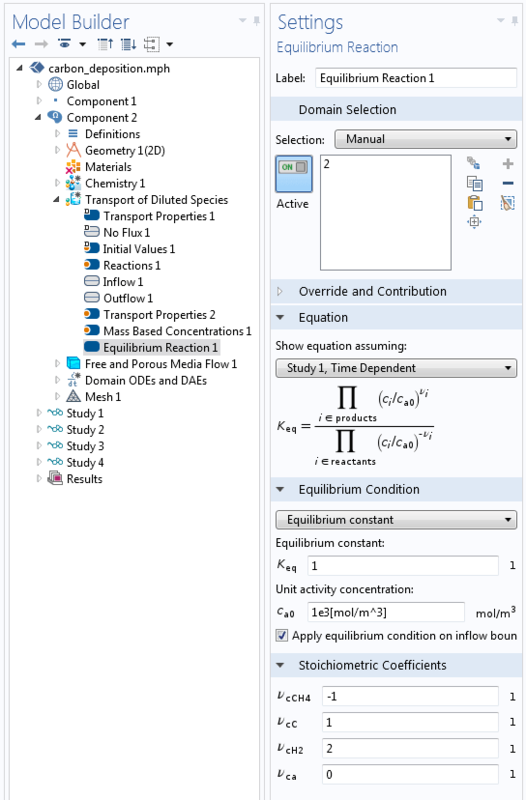 The Acoustic Diffusion Equation interface solves a diffusion equation for the acoustic energy density. It is applicable for high-frequency acoustics where the acoustics fields are diffuse. The diffusion properties are dependent on both the room geometry and absorption properties of walls, room fittings (uses average volumetric absorption based on average cross-section and attenuation), and volumetric attenuation (viscous and thermal in large volumes only). The interface is well suited for quick assessment of sound pressure level distribution inside buildings and other large structures. 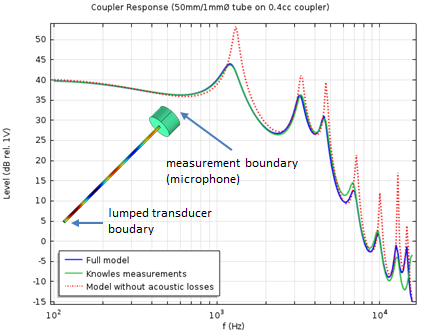 The Acoustic Diffusion Equation interface can be used to determine the reverberation times at different locations/rooms. This can be done either by performing a transient analysis and looking at the energy decay curve, or by performing an eigenvalue analysis. Inputs for all sources, absorption parameters, and transmission losses can be done using one of the bands, provided in the module. 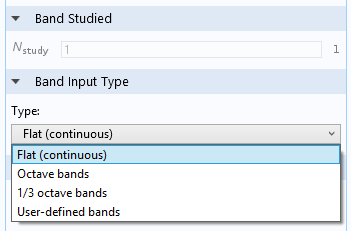 Using these input types and a parametric sweep over the studied band, the user can easily plot and analyze the model results in bands. 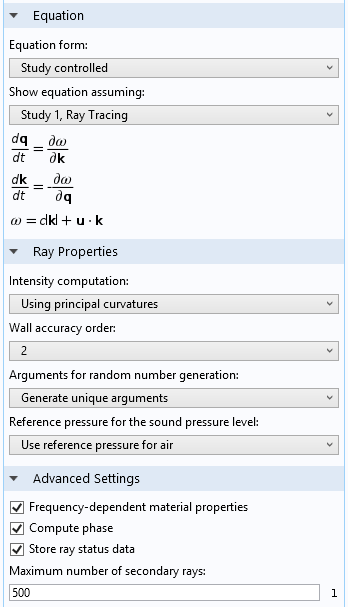 The Ray Acoustics physics interface is used to compute the trajectories, phase, and intensity of acoustic rays. Ray acoustics is valid in the high-frequency limit where the acoustic wavelength is smaller than the characteristic geometric features. The interface can be used to model acoustics in rooms, concert halls, schools, office buildings, and many outdoor environments. The properties of the media in which the rays propagate can change continuously within domains or discontinuously at boundaries. At exterior boundaries, it is possible to assign a variety of wall conditions, including combinations of specular and diffuse reflection. Impedance and absorption can depend on the frequency, intensity, and direction of incident rays. Transmission and reflection are also be modeled at material discontinuities. A background velocity may also be assigned to any medium. 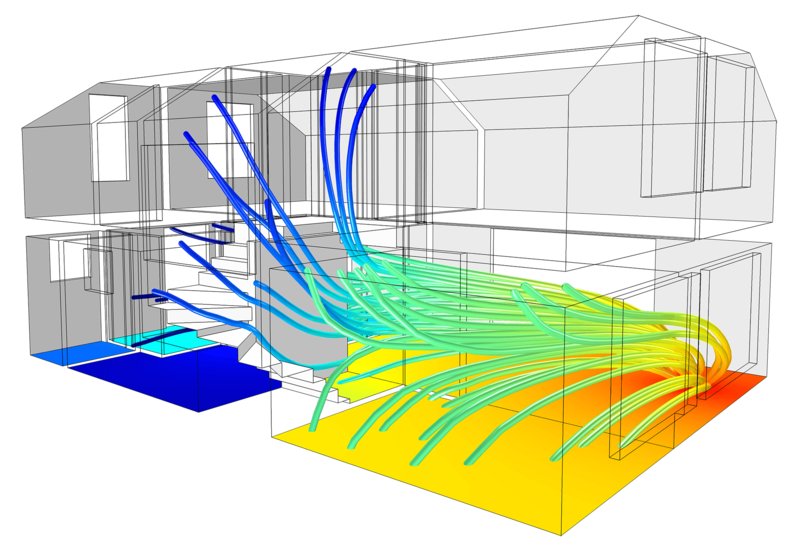 Acoustic Diffusion: The acoustics in a two story one-family house are analyzed using the acoustic diffusion equation. 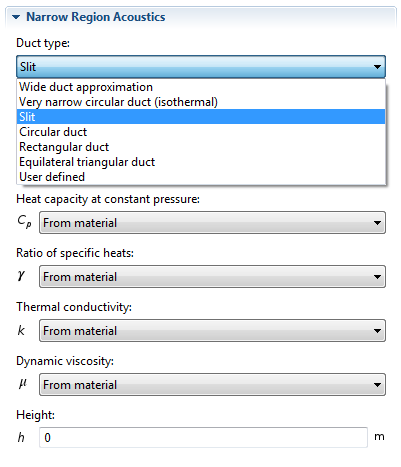 A new default Wall condition is available with options for specifying Slip/No-slip and Isothermal/Adiabatic. Any other behavior at a boundary can still be modeled by combining all the existing mechanical and thermal conditions. A new No-slip boundary condition has also been added to the Mechanical conditions list. The new Linearized Navier-Stokes, Frequency Domain and Linearized Navier-Stokes, Transient interfaces are found under the Aeroacoustics Branch. The interfaces are used to compute the acoustic variations in pressure, velocity, and temperature in the presence of any stationary isothermal or nonisothermal background mean-flow. 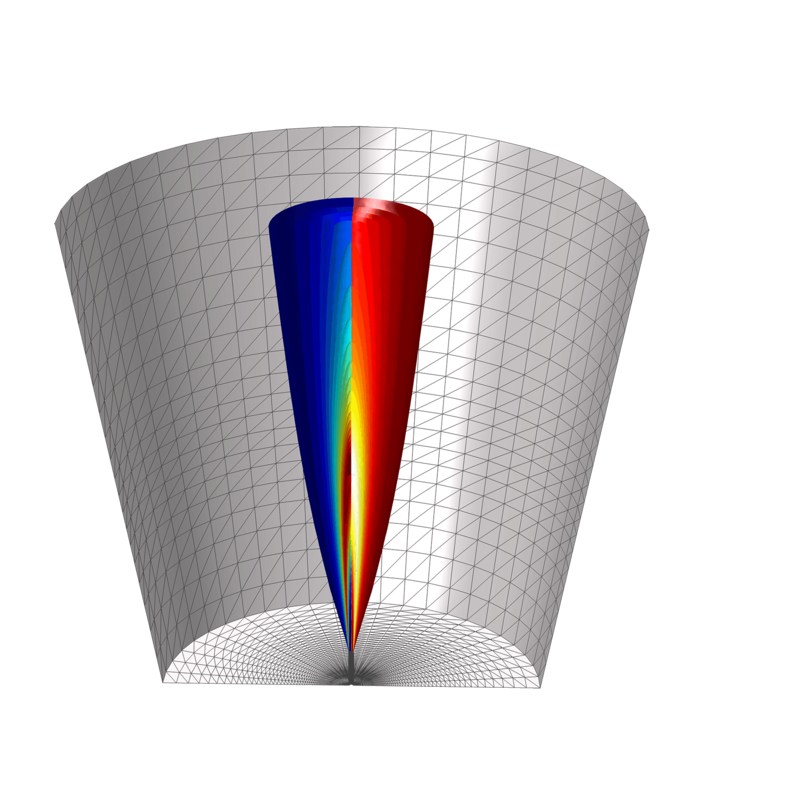 The physics interfaces are used for aeroacoustic simulations that can be described by the linearized Navier-Stokes equations. Coupling the frequency domain interface to structures, using the new Aeroacoustic-Structure Boundary multiphysics coupling, enables detailed vibration analysis of structures in the presence of flow, such as fluid-structure interaction in the frequency domain. A new Spring-Damper feature has been introduced that can connect two points with an elastic spring, viscous damper, or both. The two points can belong to a rigid domain or an attachment. One of the points can also be fixed to ground. The force acts in the direction given by the current positions of the two points. The new Base Motion feature allows the source side of a joint to have a prescribed displacement, velocity, or acceleration. The base motion is prescribed in a separate global feature, which can be referenced by the individual joints. It is now possible to connect parts modeled with the Shell and the Beam interfaces using a joint, spring or damper in the Multibody Dynamics interface. 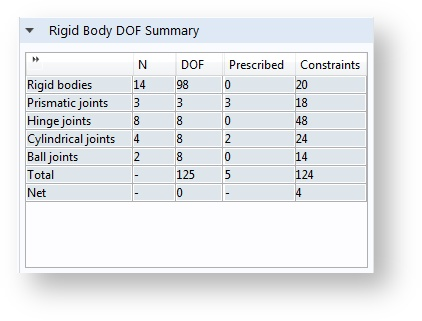 In the settings for the Multibody Dynamics interface, there is now a new section giving the number of degrees of freedom and constraints introduced by rigid bodies and joints. This is very useful information when you want to determine whether a structure is fully constrained or overconstrained. A new set of tools is available for controlling transient initialization. It is now possible to connect a Multibody Dynamics interface to the Heat Transfer in Solids interface or Pressure Acoustics interface through couplings under the Multiphysics node. Truck-Mounted Crane: This is a model of a crane consisting of 14 rigid bodies and 17 different joints. A load cycle is simulated, and forces in cylinders and axles are studied. 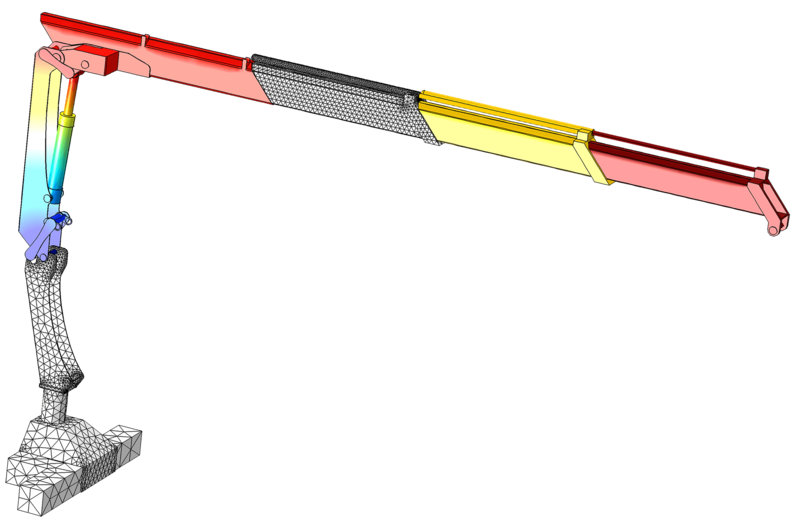 Optimization of a Crane Link Mechanism: The geometry of the inner link of the truck-mounted crane model is optimized. Three axles are allowed to move independently so that the cylinder force required to carry the load is minimized over a set of crane positions. A load cycle can be selected from the underlying parametric or time-dependent analysis. There is no longer a need to run a separate extra study for a single cycle. No other physics interface will be solved for in a Fatigue study. The aspect ratio for the Matrix Histogram height option has been adjusted to fit with the remaining dimensions. 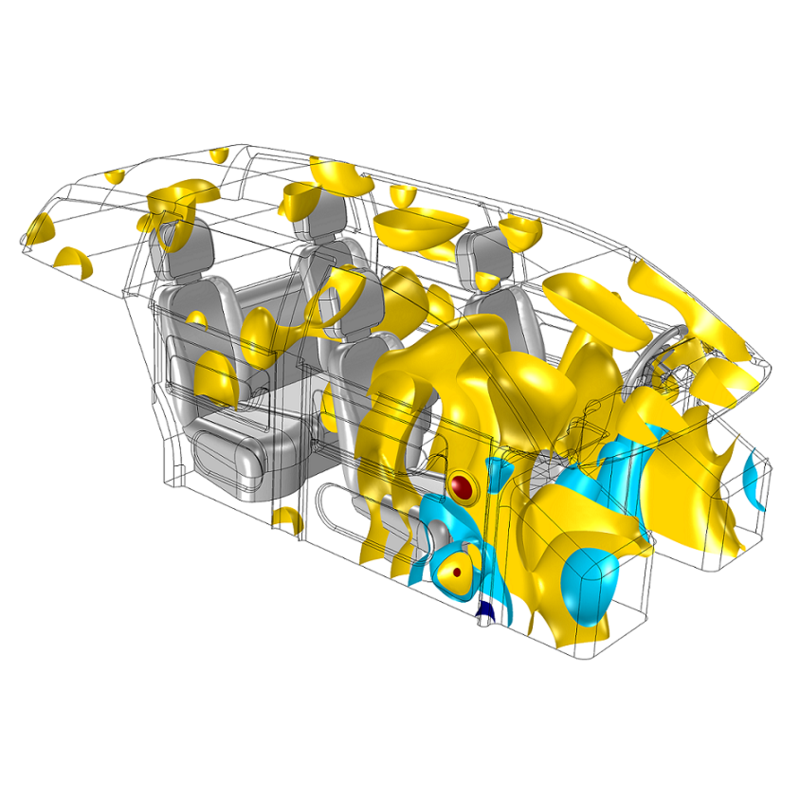 This option is used when presenting the distribution variables in a cumulative damage analysis, counted stress cycles, and relative fatigue usage in order to visualize results in 3D. 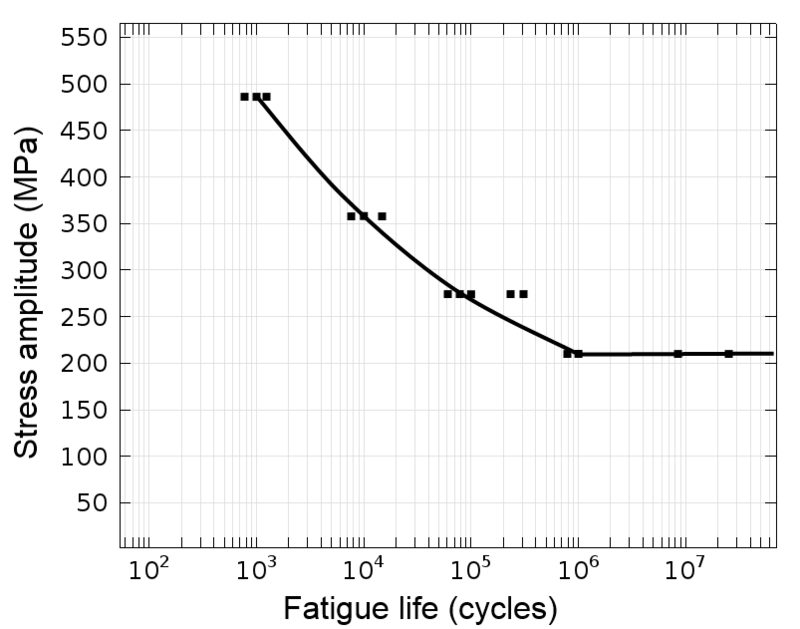 Fatigue Failure of an Eyeglass Frame: The Combined Basquin and Coffin-Manson criterion relates the strain amplitude to the fatigue life in both low-cycle and high-cycle fatigue. The use of this fatigue criterion is demonstrated in a model of eyeglasses that are subjected to bending. Shown are the the first principal strain and the third principal strain, where the analysis indicates that the eyeglass frame will break in the thin section over the nose. Stress-Life Model: Fatigue life in the connecting rod of an engine. 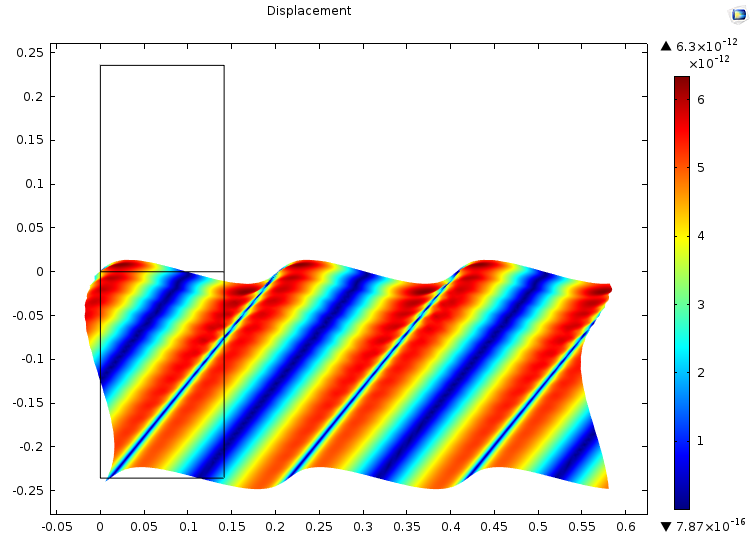 The Basquin model evaluates a load cycle simulated using the Multibody Dynamics Module. Fatigue Study Feature: Fatigue failure in a viscoplastic solder joint. Several cycles are simulated before a steady state load cycle is obtained. Using the fatigue study, the stable load cycle is directly processed without recalculation of the last cycle in a separate analysis. Distribution Variables in 3D: Stress distribution in the critical point of a frame. 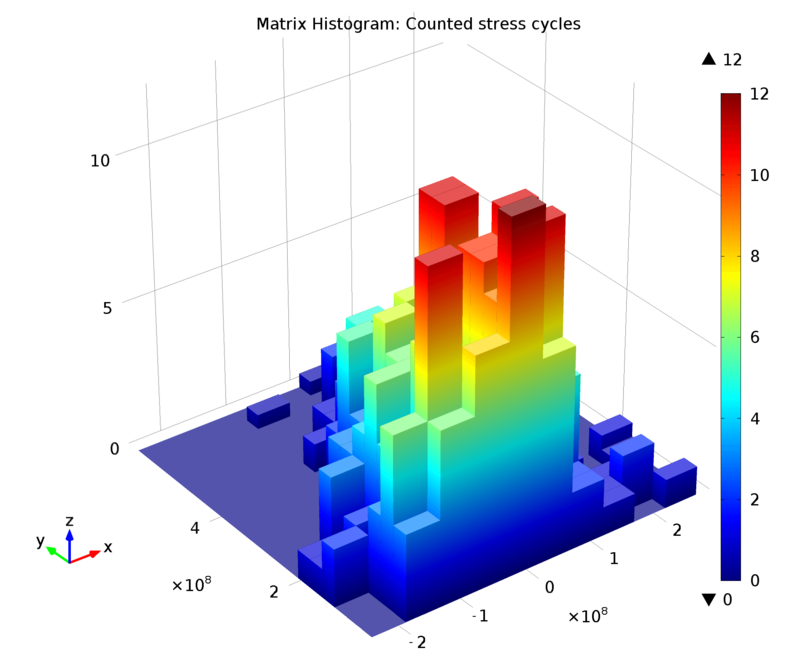 Matrix histogram displays the number of cycles experienced for a given mean stress and a given stress amplitude. Beams are now allowed to have large deformations: large rotations and small strains. The Spring Foundation and Thin Elastic Layer features have been generalized so that the spring force vs. displacement and the damping force vs. velocity relations can be entered in matrix form, rather than component-wise. 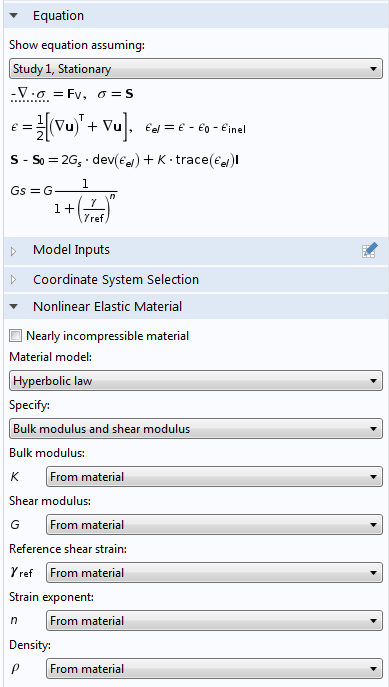 Hygroscopic swelling is now available in all the structural mechanics interfaces. There are now built-in features available for couplings between beams and shells with options for: common edge, parallel edges, point on beam to shell edge, and point on beam to shell boundary. 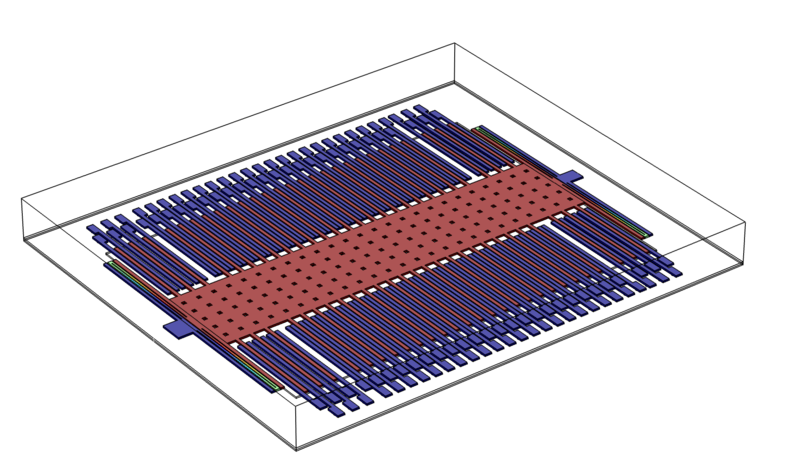 The Piezoelectric Devices interface has been replaced by a Multiphysics node called Piezoelectric Effect, which connects a Solid Mechanics interface and an Electrostatics interface (see also the MEMS Module). The material model for membranes can now be: orthotropic, anisotropic, or hyperelastic (requires the Nonlinear Structural Materials Module). It also contains new features: Prescribed Velocity, Prescribed Acceleration, Symmetry, and Antisymmetry. 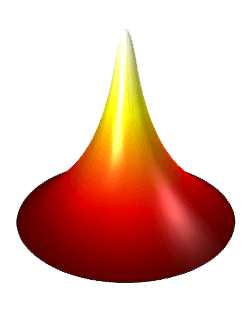 A Point mass node has been added in the Shell and Plate interfaces and it is also possible to enter a mass moment of inertia tensor. Shells and beams can be connected to Multibody Dynamics models. New plot types clearly display thickness and orientation for shell and beam elements. Cohesive Zone Modeling of Mixed-Mode Debonding. Instability of a Space Arc Frame. New Model - Connecting Shells and Beams: In this tutorial and verification model, it is shown how to connect beam and shell elements in different situations. The results are also compared to a solid model of the same geometry. Various improvements to shells and beams: This model contains a simplified multibody dynamics model of a horizontal-axis portable washing machine. An eigenfrequency analysis is performed to compute the natural frequencies and mode shapes of the entire assembly. 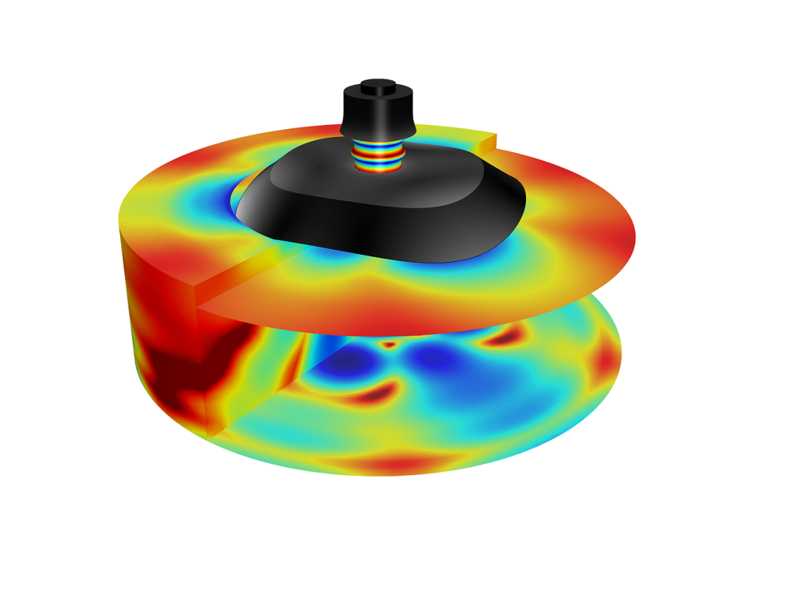 Transient analysis is performed to find out the vibrations induced in the housing, modeled as a flexible shell, during the spinning cycle. This version of the balloon inflation model demonstrates how the Membrane interface can be used to model thin hyperelastic structures. 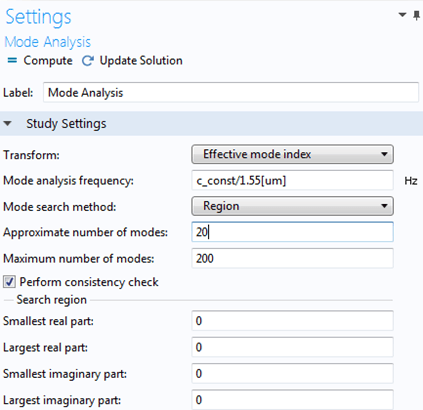 Settings window for the Power-Law model. 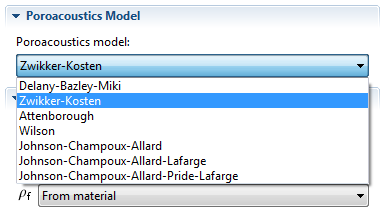 Settings window for the Power-Law model. Settings window for the Ramberg-Osgood model. Settings window for the Ramberg-Osgood model. 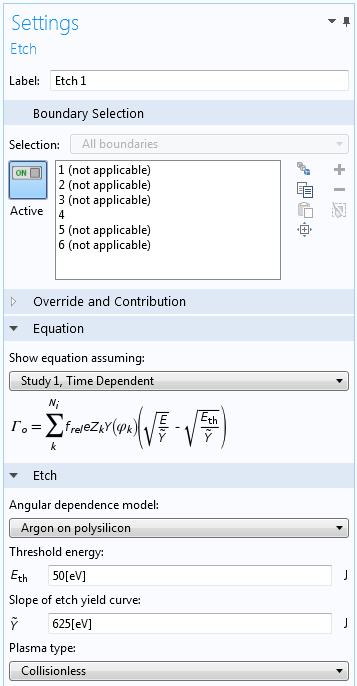 Settings window for the Hyperbolic Law model. Settings window for the Hyperbolic Law model. Settings window for the Hardin-Drnevich model. Settings window for the Hardin-Drnevich model. The new algebraic turbulence models yPlus and L-VEL are so-called enhanced viscosity models and are suitable for interior flows such as in electronic cooling applications. The algebraic turbulence models are computationally less expensive and more robust but, in general, less accurate than transport equation models like the k−ε model or the Spalart-Allmaras model. The new turbulence models are available in Single-Phase Flow and in the weakly coupled multiphysics interfaces: Non-Isothermal Flow and Conjugate Heat Transfer. The Inlet boundary condition for fluid flow has been revised for improved mass conservation as well as faster and more robust convergence. The new Inlet feature has only one Pressure option, which corresponds to the Normal Stress option of earlier versions. The settings window for the new Pressure option is shown below. In addition to an edit field for the pressure, p0, there is a check-box for Suppress backflow. Suppress backflow reduces the tendency for fluid to exit the domain at the inlet. It does not completely prevent backflow, and in the case that backflow occurs, this option locally increases the specified pressure. Flow reversal can lead to convergence problems or non-physical solutions. The Suppress backflow option is therefore selected by default. The flow direction at the inlet can either be set to Normal flow (the default) or User defined. All transport-equation turbulence models (k−ϵ,k−ω, SST, Low Reynolds number k−ϵ and Spalart-Allmaras) have faster convergence and improved stability properties in the new version compared to previous versions. The main changes concern regularizations and tuning of stability parameters. For models with low resolution, the results will appear sharper in the new version due to the lower amount of diffusivity introduced by the consistent stabilization schemes. The Bubbly Flow and Mixture Model interfaces now support pseudo time-stepping, which makes it much easier to solve stationary models. 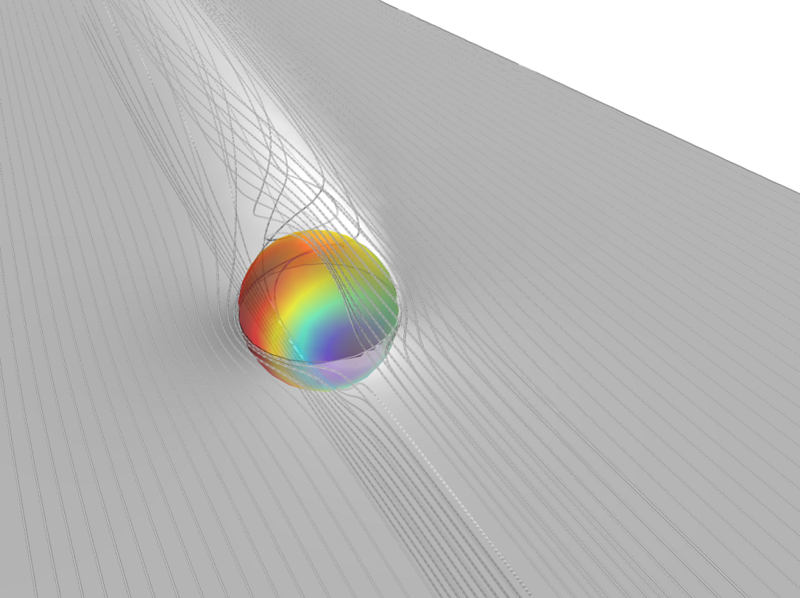 The SST Turbulence Model is now available in the Reacting Flow interface. SST is a low-Reynolds number model which for reacting flow means that it supports the high Schmidt number model for turbulent mixing. The High Schmidt number model can be selected in the interface settings. 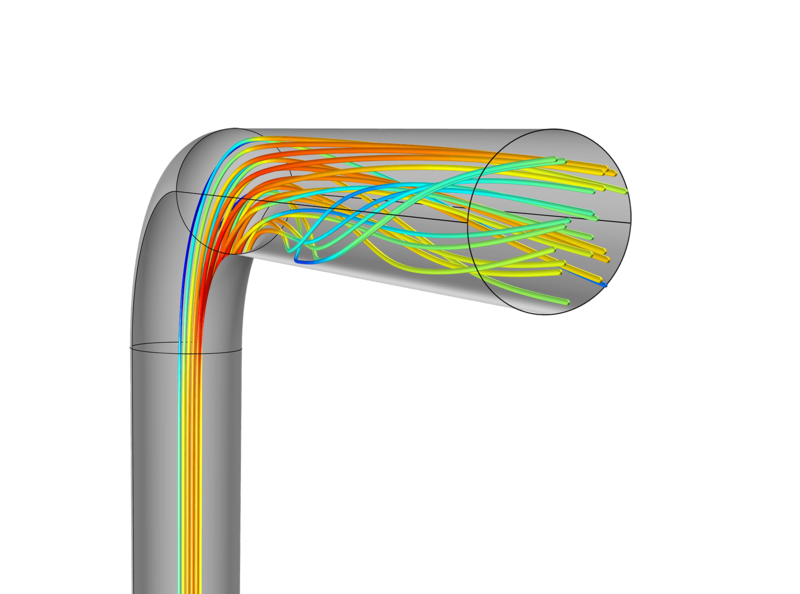 Turbulent Flow: Simulation of turbulent flow in a piping system. 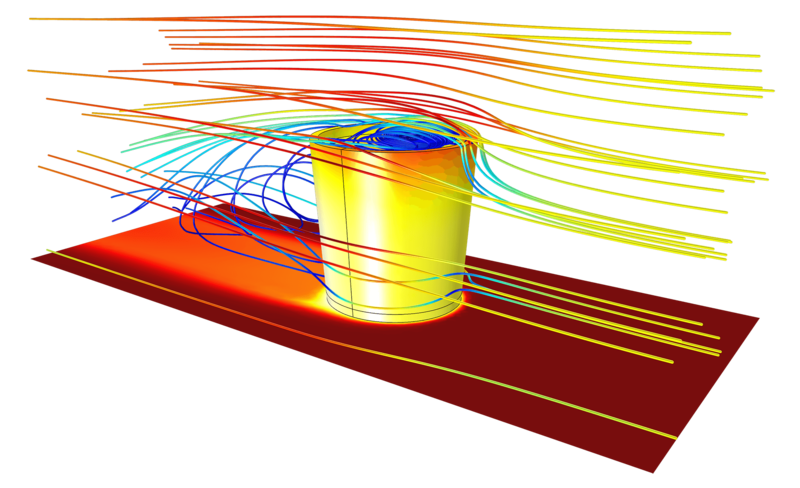 Results show a separation zone after the bend, vortices in the outlet section, and the pressure drop across the pipe. Updated Fan and Grille Features: The Fan, Interior Fan, and Grille features have been updated to take turbulence into account. Additionally, the Interior Fan feature has been updated with the Nonisothermal Flow coupling feature. The Fan, Interior Fan and Grille features are now available for turbulent flow. 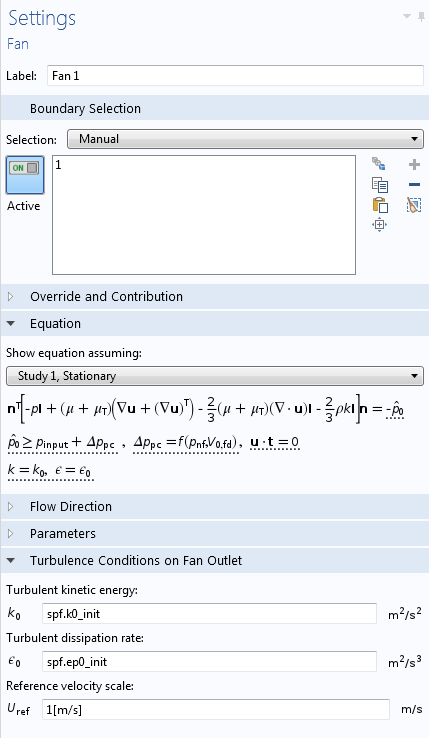 For the supported transport-equation turbulence models: k−ϵ, k−ω, SST and Low Reynolds number k−ϵ, the Fan GUI in the new version includes a section for specifying the turbulence variables, k0, ϵ0 or ω0 on the downstream side of the fan. It is now possible to specify the Inlet flow direction for the Fan and Grille features. 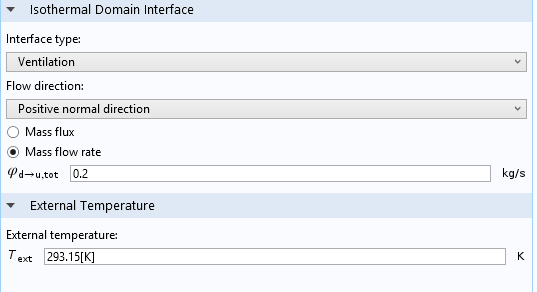 The options are Normal flow (the default) and User defined. The screenshots below show the Fan settings windows for the two options. Both features suppress backflow at the inlet by increasing the applied pressure. Flow reversal at inlet devices can lead to convergence problems or non-physical solutions. The Fan and Grille features are available in the Single-Phase Flow, Non-Isothermal Flow, Conjugate Heat Transfer, Reacting Flow and Fluid-Structure Interaction, Fixed Geometry (requires the Structural Mechanics Module or the MEMS Module) interfaces. 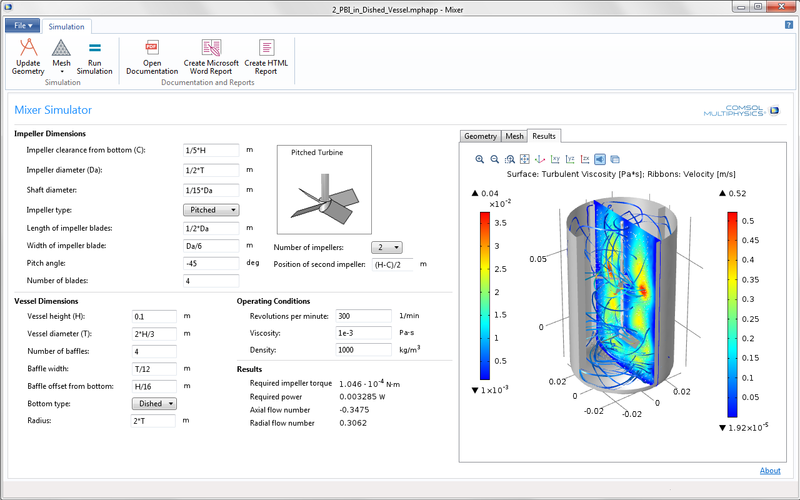 The Thin-Film Flow interface, which is used for lubrication and elastohydrodynamics simulations, now supports cavitation. To eliminate the risk of having inconsistent reference pressure definitions in different features within a component, all fluid flow interfaces now announce the Absolute pressure. Each interface using a relative pressure internally has a user input to define the Reference pressure level (see the screen shot below) which is set at the physics interface level. The fluid flow interfaces announce the Absolute pressure as the sum of the relative pressure and the Reference pressure level. 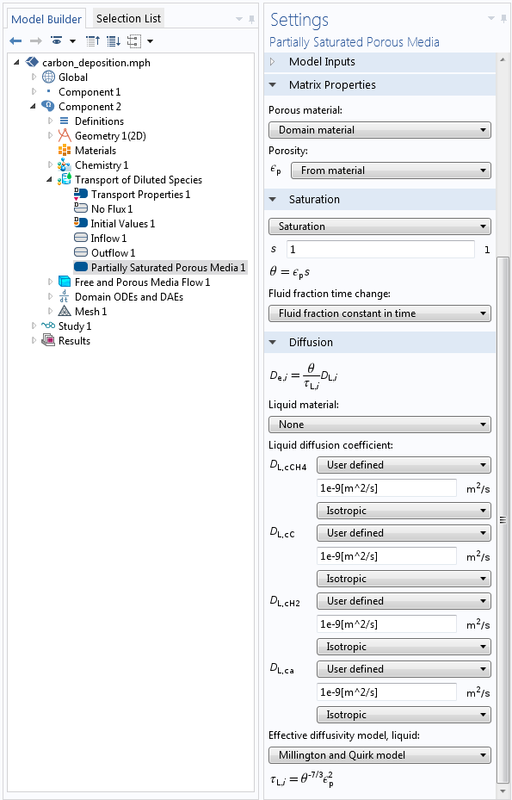 The Absolute pressure is automatically detected when needed in the Model Inputs section in the fluid flow interface (eg to define the density from the ideal gas law) and can readily be selected in the Model Inputs sections of adjoining interfaces. 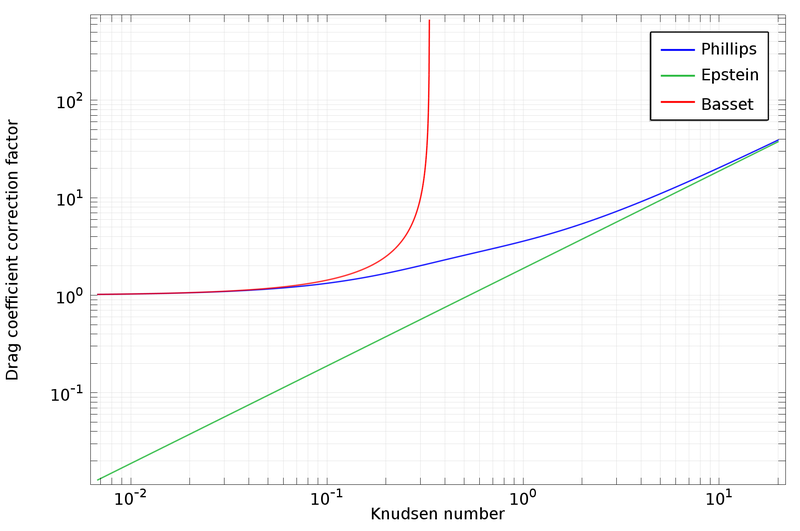 The new default values for the phase viscosities in the Euler-Euler interface are defined using a Krieger-like expression. Lower case subscripts are used to define properties of the pure phases while upper case subscripts are used when the two phases coexist as interpenetrating media. The new default values give a numerically well posed problem, and better consistency with the Mixture Model. 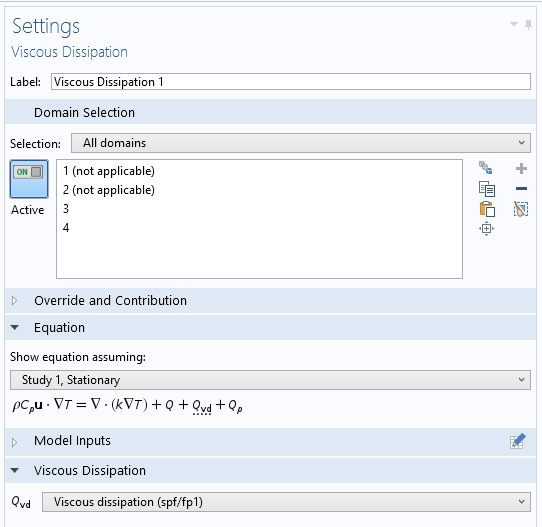 The Viscosity model drop-down list also contains a User defined option. The Wall Distance interface, which can be used as a stand-alone interface and is also added when using a turbulence model requiring the distance to the nearest wall (Algebraic yPlus, L-VEL, SST, Low Reynolds number k−ϵ or Spalart-Allmaras), has been updated with a more robust Continuity feature and a new Periodic Condition feature able to model periodicity on non-parallel boundaries with non-matching meshes. 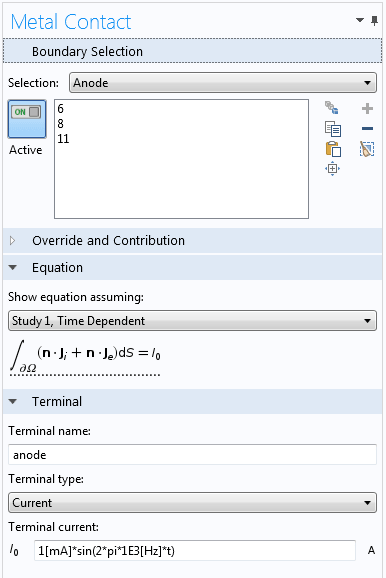 Support for studying two-phase flow in rotating machinery has been included in the Mixer Module. The new Rotating Machinery, Mixture Model interfaces combine rotating machinery capabilities and the mixture model for two phase flow. Two new interfaces have been introduced in the Model Wizard under the new subbranch Rotating Machinery, Multiphase Flow, one for laminar flow and one for turbulent flow (using the k−ε turbulence model). 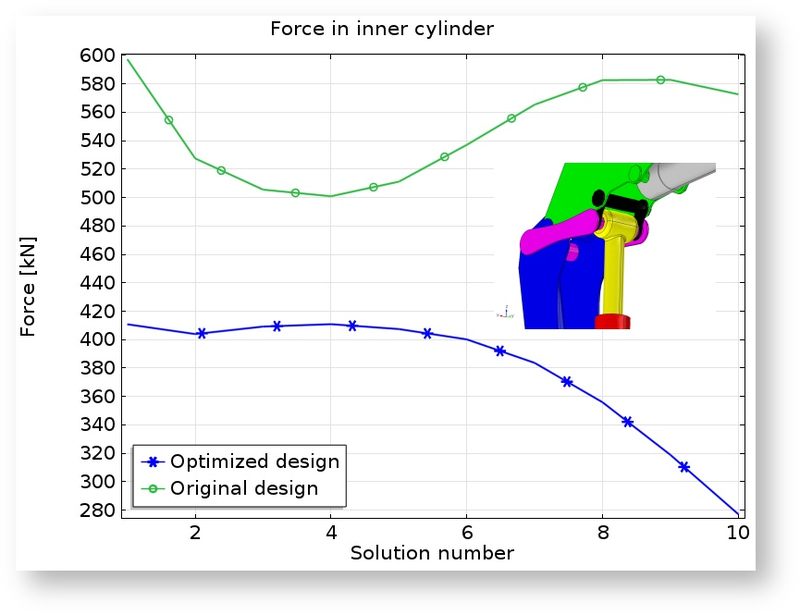 This new application in the Application Library allows you to simulate a dished-mixing vessel by varying geometrical parameters, the number of impellers and impeller types, as well as operating conditions to get results on impeller torque, and required power. This new application in the Application Library allows you to simulate a dished-mixing vessel by varying geometrical parameters, the number of impellers and impeller types, as well as operating conditions to get results on impeller torque, and required power. 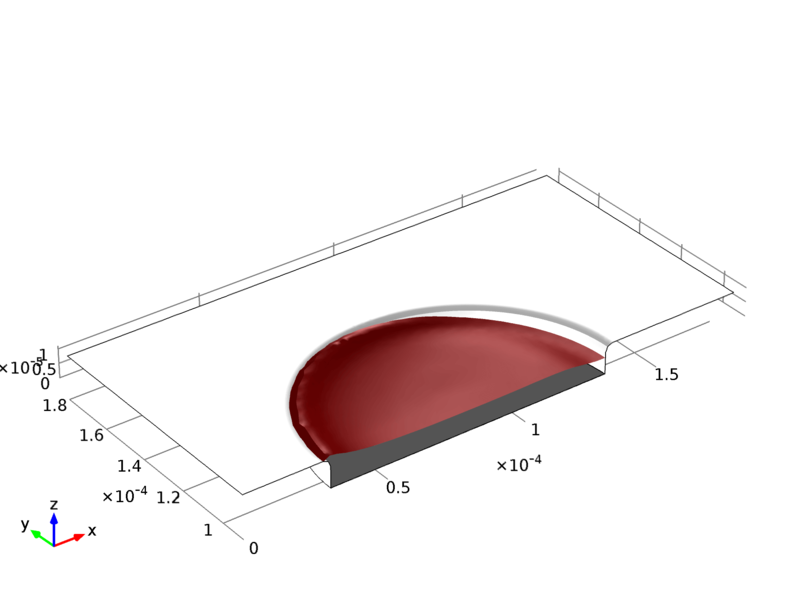 The Navier-Slip, External Free Surface, Fluid-Fluid interface, and Wall Contact features have been improved for curved boundaries. Symmetry, Flow and Symmetry, and Heat have been merged into a single feature called Symmetry. Flow Continuity and Heat Continuity have been merged into a single feature called Continuity. Periodic Flow Condition and Periodic Heat Condition have been merged into a single feature called Periodic Condition. 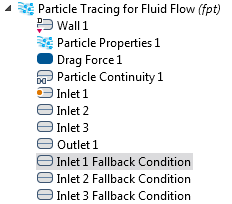 The Open Boundary feature now includes settings for both heat transfer and fluid flow. Improved Implementation of the Two-Phase Flow, Moving Mesh Interface: Free surface oscillations for a cylindrical water droplet with a step change in contact angle. It is now possible to reconstruct the number density on Axial Symmetry boundaries. Gas cells have several applications in scientific instrument design. A gas cell is used to define a high pressure region within the instrument's main vacuum system. For example, in this application note we are designing a high pressure region 100 mm long with an operating pressure of 1e-3 Torr inside the collision cell and a main vacuum system pressure of 1e-5 Torr. In mass spectrometry, typical applications are the removal of mass spectral interferences in Inductively Coupled Plasma Mass Spectrometry (ICPMS) or as a collision cell promoting ion molecule reactions or fragmentation in tandem mass spectrometry (MS-MS). This model requires the Particle Tracing Module. Charge Exchange Cell: A gas cell is used to define a high-pressure region within the instrument's main vacuum system. In mass spectrometry, typical applications are the removal of mass spectral interferences in Inductively Coupled Plasma Mass Spectrometry (ICPMS) or as a collision cell promoting ion molecule reactions or fragmentation in tandem mass spectrometry (MS-MS). 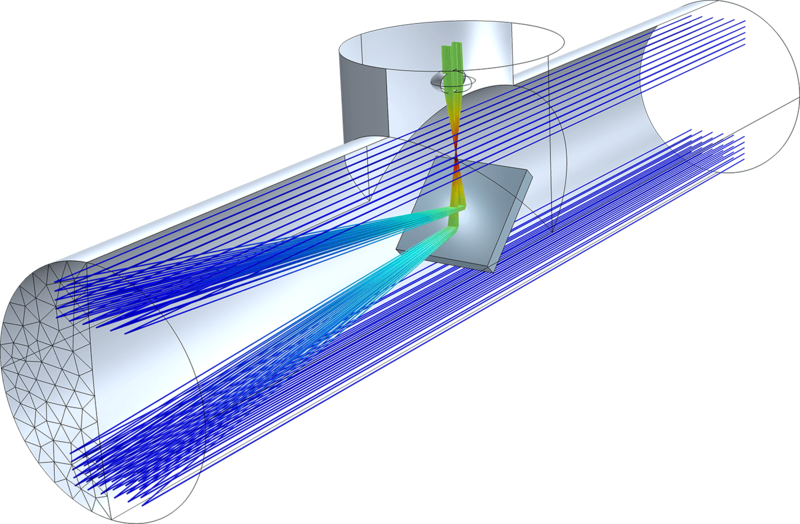 The 3D Laminar Flow interface can now be coupled to a 1D Pipe Flow interface through the Pipe Connection feature. The Non-Isothermal Pipe Flow interface now has an optional Pressure Work term that can be activated when the pressure drop is expected to be considerable and the fluid is compressible. The Pressure Work term is added in the heat equation. The Transport of Diluted Species in Porous Media interface is a new entry point in the Model Wizard under Chemical Species Transport, with a default Porous Media Transport Properties domain feature. It replaces and unifies the old Solute Transport and Species Transport in Porous media interfaces. The Transport of Diluted Species in Porous Media interface also includes numerical stabilization methods for the porous media features. This gives smooth concentration fields even in the cases where some regions of the domain are numerically under-resolved. It also includes the Species Source feature, accounts for sources (or sinks) of chemical species in porous domains. 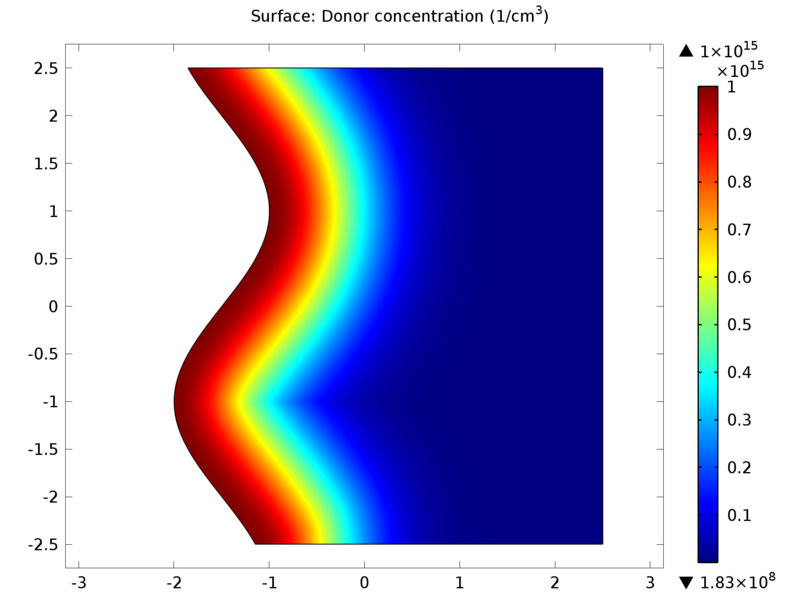 The Partially Saturated Porous Media feature in the Transport of Diluted Species interface allows for the modeling of convection, diffusion, adsorption, dispersion, and volatilization in partially saturated porous domains. In addition, a new Porous Media Transport Properties feature in the Transport of Diluted Species interface provides access to the same functionality. It also includes the Species Source feature, accounts for sources (or sinks) of chemical species in porous domains. 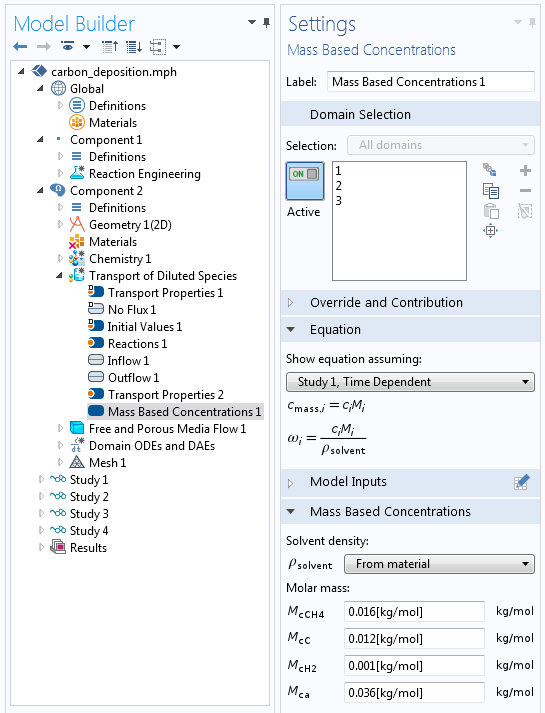 The Mass-Based Concentrations feature in the Transport of Diluted Species interface allows you to specify the solvent density and molar mass per species. A new option for Danckwerts inflow is available in the Inflow feature of the Transport of Diluted Species and Nernst-Planck interfaces. 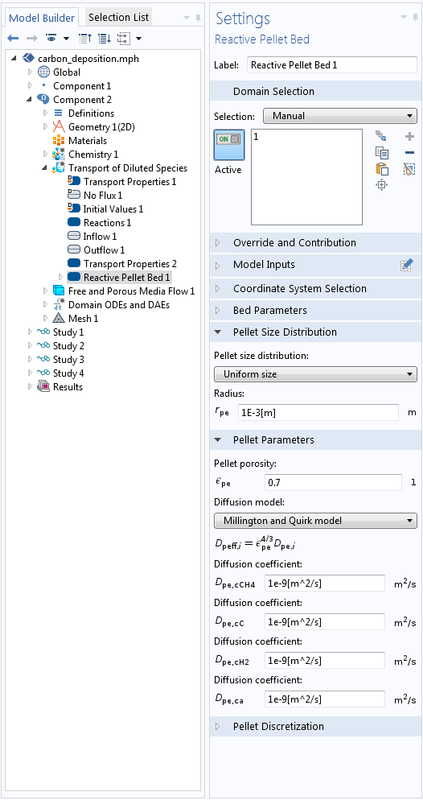 To make it easier to model packed-bed reactors, a new feature for modeling transport and reaction equations inside pellets is available, which uses the new core technology for extra dimensions. The extra dimension is set to be 1D. The average concentration in a pellet is available for postprocessing. New model: A Multiscale 3D packed bed reactor. One of the most common reactors in the chemical industry, the packed bed reactor is used both in synthesis as well as in effluent treatment and catalytic combustion. 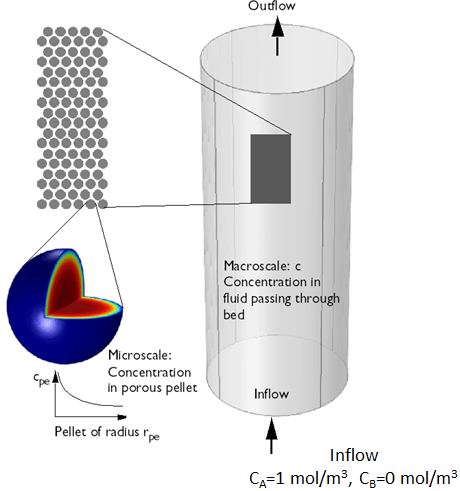 This model analyses the concentration distribution in the reactor gas that flows around the pellets (macroscale), but also uses an extra dimension that models the concentration distribution inside each porous catalytic pellet (microscale). A new Chemistry interface, similar to that of the Material Library, contains a library of thermodynamic and kinetic properties for a given chemical reaction system. 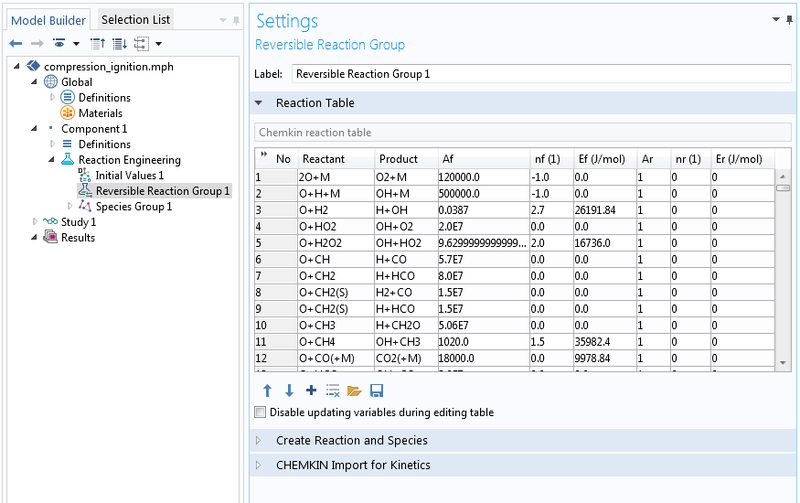 The Reaction Engineering interface has been revamped to improve user experience and now includes five new features under the Reaction Engineering interface node: Initial Values, Reversible Reaction Group, Equilibrium Reaction Group, Species Group, and Additional Sources. 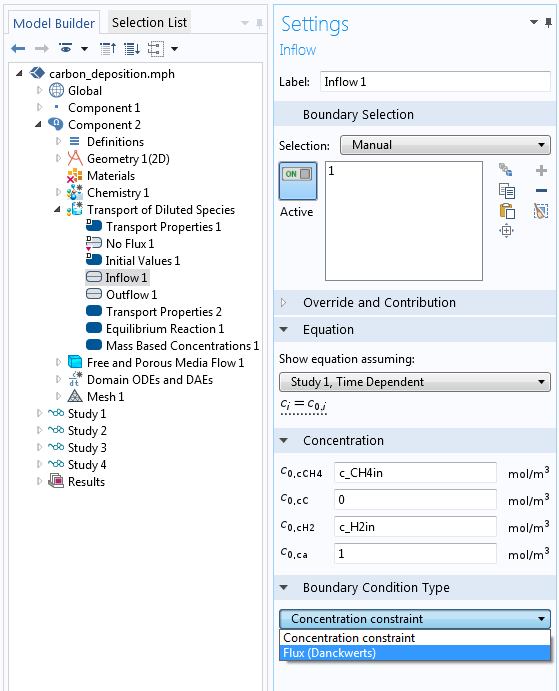 Additionally, there are several new sub-features: reaction thermodynamics for the Reaction group features (reversible and equilibrium), and two sub-features for the Species Group feature (Species Activity and Species Thermodynamic). There are also three new physics properties: Energy Balance, Equilibrium Species Vector, and Global Activity Standard State. The CSTR reactors now allow multiple inlets and outlets (by changing from Constant Mass to Generic Mass in Mass Balance property) and filling/draining: The species inflow from all feed streams is additive (earlier, the Reaction Engineering interface only accepted one feed stream for one species). The Reaction feature can be both volumetric and surface-based (these were separate features in previous versions). Improved surface reactions are solved for if a species is set to surface species. In this case, the rate expression of reactions is used instead of a bulk mass balance, and the species production exports correctly to influx conditions in space-dependent models. Heat flux is included in the energy balance when there is a surface reaction. The concentration (mol/m3) has been replaced by activity in the law of mass action for the determination of the reaction rate. The space-dependent model created by the Generate Space-dependent Model feature is not linked back to the Reaction Engineering interface. A new Equilibrium Reaction domain node is available in the Transport of Diluted Species interface, the Reacting Flow in Porous Media Diluted Species interface, and the Nernst-Planck interface. A Multiscale 3D Packed Bed Reactor: New model that illustrates the new Reactive Pellet Bed interface. Neutralization of Chlorine in a Scrubber: New model that demonstrates the new Equilibrium Reaction feature. Reactive Pellet Bed Interface: A new feature that allows for the multiscale simulation of the reactive catalytic pellets in a packed bed. Both the microscale concentration inside each pellet and the macroscale concentration in the bed volume can be accounted for. Equilibrium Reaction Feature: Many industrial processes leave remainders of toxic dissolved metal ions in process flows. A common method for removing metal ions from water is complexation. This model example shows a purification reactor where silver ions are complexated to diamine-silver for removal. Ammonia is added across a membrane in a tubular reactor in order to remove silver ions from a water stream. 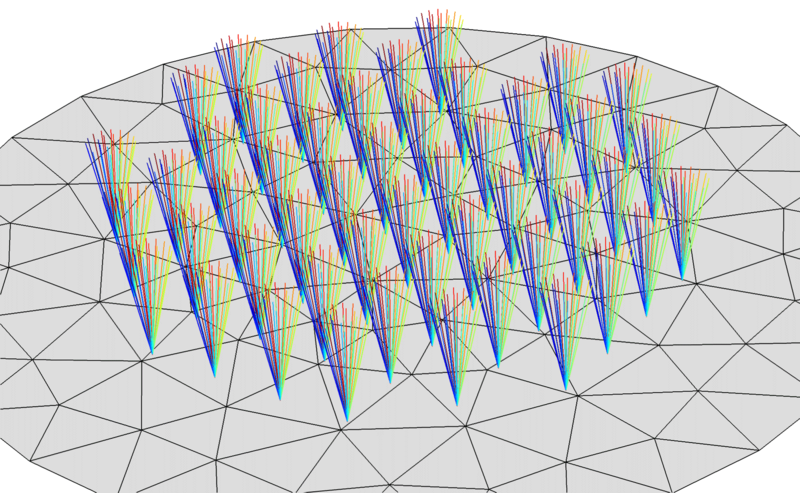 The new core functionality for extra dimensions is now used for the implementation of porous electrodes. This affects the Lithium-Ion Battery interface and the Battery with Binary Electrolyte interface, as well as the nodes for Porous Electrode and Additional Intercalating Material. It is now possible to use radially and concentration-dependent solid diffusion coefficients. You can set the parameter Ds in the GUI as Ds(xspce1, liion.cspce1), where Ds(arg1, arg2) is a user-added function (under Definitions) with the particle location and the local concentration as arguments. Materials are updated for all types of batteries with non-isothermal properties inserted. New positive and negative lithium-ion battery electrode materials have been added. Both polymer and liquid electrolytes are now available. 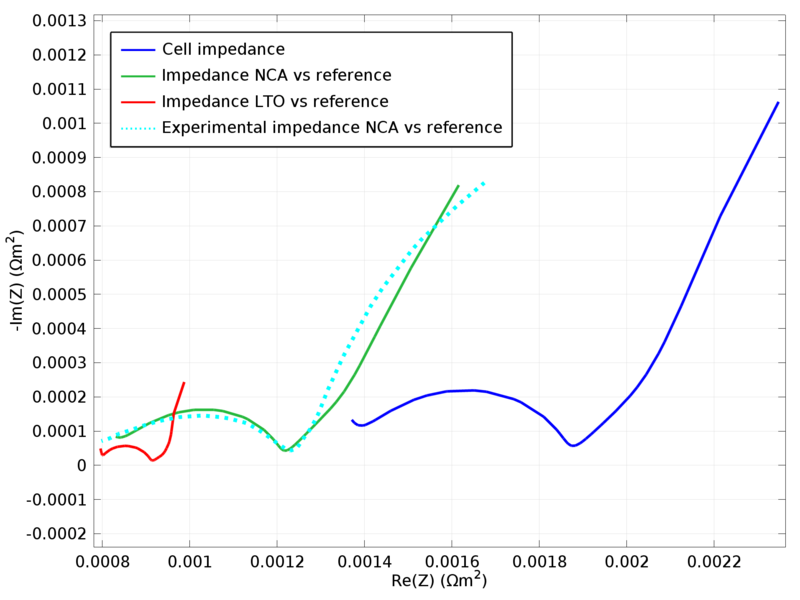 Lithium-Ion Battery Impedance: This new model uses the Lithium-Ion Battery interface and the Optimization interface (Optimization Module) to simulate and analyze the impedance spectra of lithium-ion batteries. This new model features coupled convection-diffusion and electrodeposition with a deforming geometry in 3D. Microconnector Bump in 3D: This new model features coupled convection-diffusion and electrodeposition in a deforming geometry in 3D. 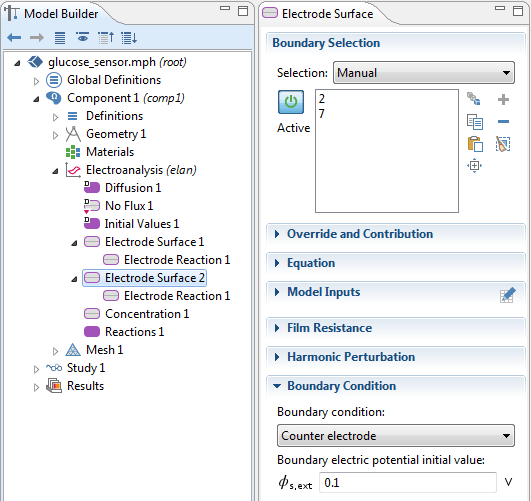 A new default feature, Nondepositing/Noncorroding Boundary, is available in the Electrodeposition and Corrosion interfaces and is used for specifying non-deforming (in the normal direction) boundaries. The feature provides consistent handling of point/edge conditions between deforming electrodes and non-deforming boundaries for arbitrary geometries. Also in the Electrodeposition Module. This new model includes a Transport of Diluted Species interface together with four equilibrium reaction features. 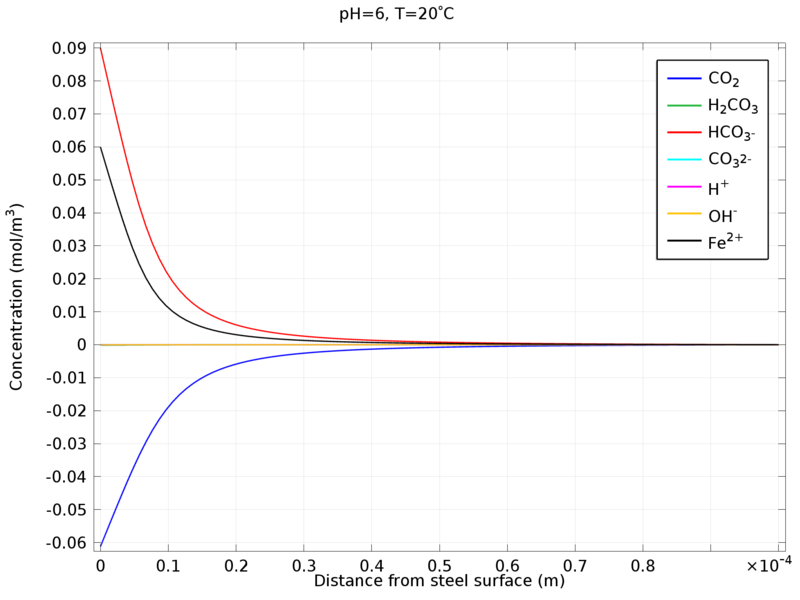 Seven species dissolved in aqueous solution are modeled in the boundary layer close to a steel surface. The Boundary Element Method (BEM) interface solves for the Laplace equation around electrodes consisting of a set of tubes, which in the model are defined by edges - each edge with a parameter that gives its radius. 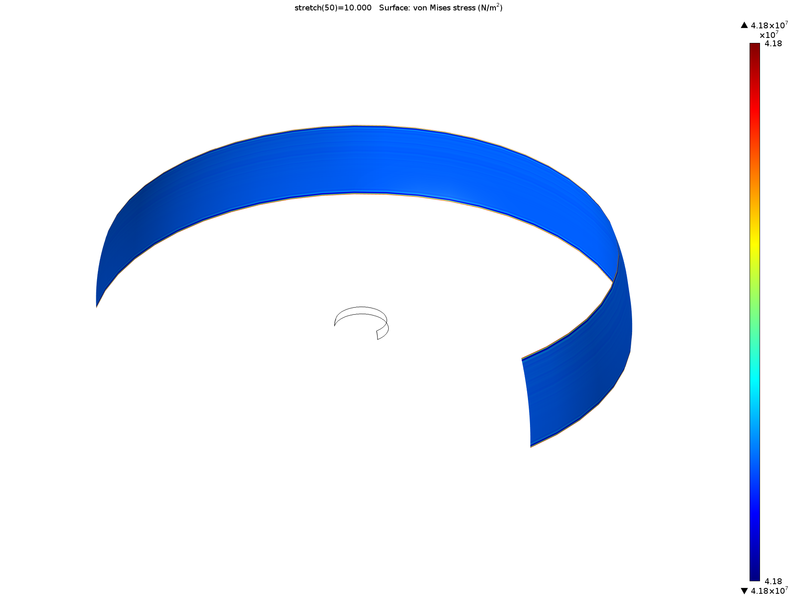 The BEM interface for edges is available for 3D components. For complex geometries that can be approximated as a set of tubes, the interface significantly decreases the mesh time, solver time, and memory usage. 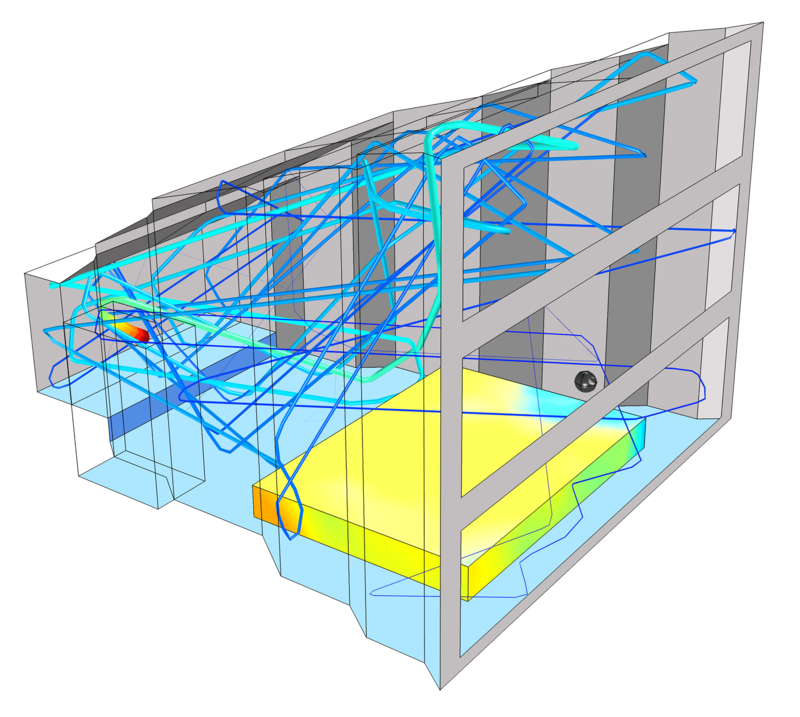 A typical application is the modeling of steel structures submersed in seawater (see image). This feature is also available in the Batteries & Fuel Cells, Electrodeposition, and Electrochemistry Modules. CO2 Corrosion: This new model is solved using a Transport of Diluted Species interface together with four equilibrium reaction features. Seven species dissolved in an aqueous solution are modeled in the boundary layer close to a steel surface. 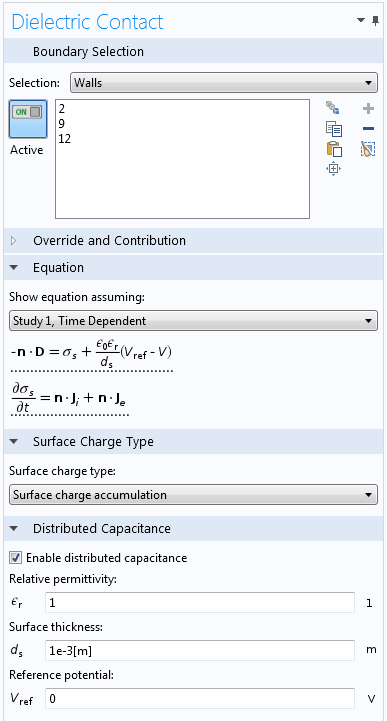 This new feature is included in all electrochemistry products and takes care of the overall charge balance of the cell. As an illustration of this, see the updated Glucose Sensor tutorial model. This feature is also available in the Batteries & Fuel Cells, Electrodeposition, and Corrosion Modules. Counter Electrode Feature: The feature ensures the overall charge balance of the cell by automatically adapting the electrode potential so that the integral of all electrode currents in the cell becomes zero. New tools for creating study references enable multianalysis optimization using combinations of optimization studies. When you stop any optimization solver, you now have the option to choose to continue. A new parameter estimation study step simplifies basic parameter estimation and target matching. A new derivative-free method, Constraint Optimization by Linear Approximation, (COBYLA) is available, as well as improved optimization solvers. This is an iterative method for derivative-free constraint optimization. Each iteration forms linear approximations to the objective and constraint functions by interpolation at the vertices of a simplex and a trust region bound restricts each change to the variables. 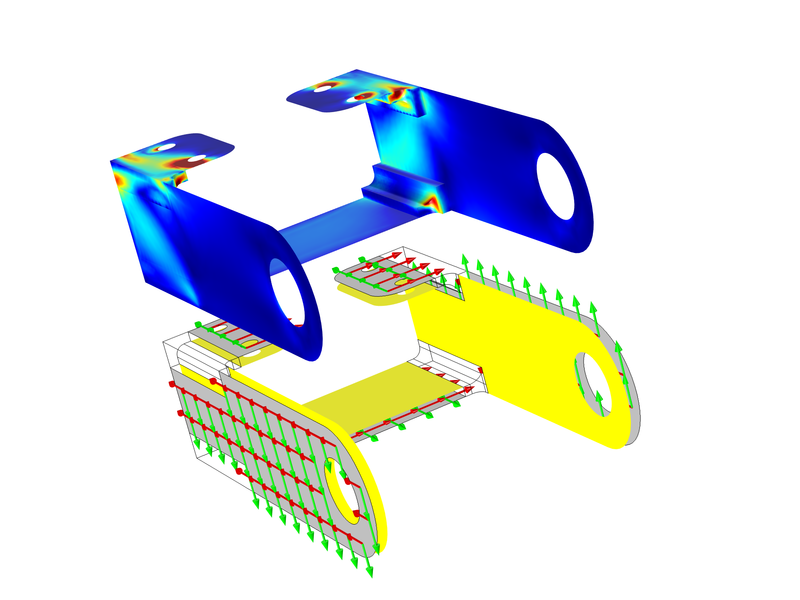 Multianalysis Optimization: Simulation of a bracket used for mounting heavy components on vibrating foundations. Results show the deformation in an eigenmode in the steel after the hole radii and indentation widths have been optimized for weight reduction. The Accumulator features are general-purpose tools that define dependent variables, called accumulated variables, on domains or boundaries. 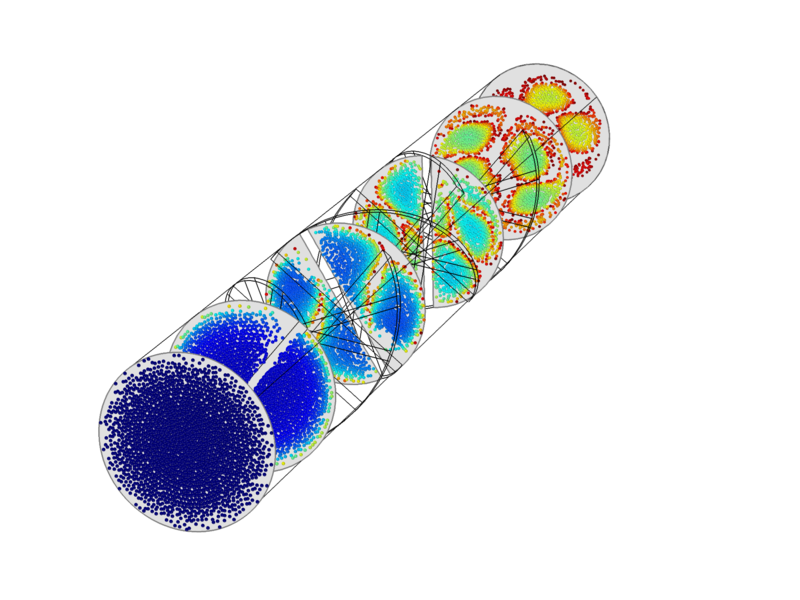 The values of these variables are then updated as particles move through the domains or collide with the boundaries. The accumulated variables may be dependent on properties of both the domains and the particles. Built-in settings are available to either compute the accumulated variables based on the current position of each particle, or based on the particle positions at all previous time steps. The Accumulator can be used either to count particles within a certain region, or to compute the density of various particle properties, such as mass density, number density, and charge density. Alternatively, an Accumulator can be added to a Wall, Outlet, or Axial Symmetry boundary feature. In this case, the accumulated variable is only defined on the boundary, and is only changed when particles interact with boundaries. This provides an efficient means of counting collisions with walls, and can also be used to compute the flux of any particle property at the boundary. For example, an Accumulator can compute the momentum flux at a boundary, which can then be used to compute pressure. The Accumulators can work with in conjunction with the Moving Mesh interface, so the geometry can deform based on the flux of particles onto the surface. Accumulation of Particles on a Surface: A new feature in the Particle Tracing Module allows for the simulation of the accumulation of particles, as well as erosion and etching. Erosion: This allows the erosion rate to be computed on selected boundaries. Mass Deposition: This allows the total deposited mass to be computed on selected boundaries. Boundary Load: This computes the force per unit area or pressure on selected boundaries due to an incident particle flux. The computed value can be used in, for example, a structural mechanics simulation. Mass Flux: This computes the mass flux vector or normal mass flux incident on selected boundaries. Etch: This feature computes the etch rate on selected boundaries. Current Density: This feature computes the current density or normal current density on selected boundaries. The computed value can be used in, for example, an electric currents simulation. 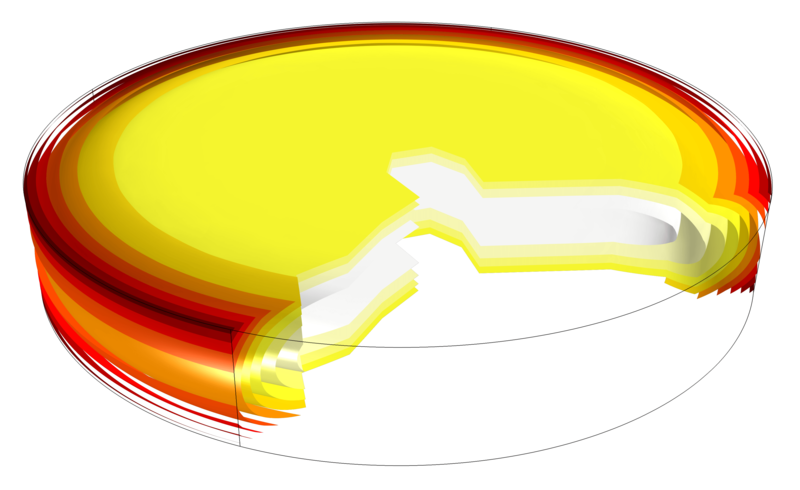 Heat Source: This feature computes the heat source on selected boundaries due to an incident particle flux. 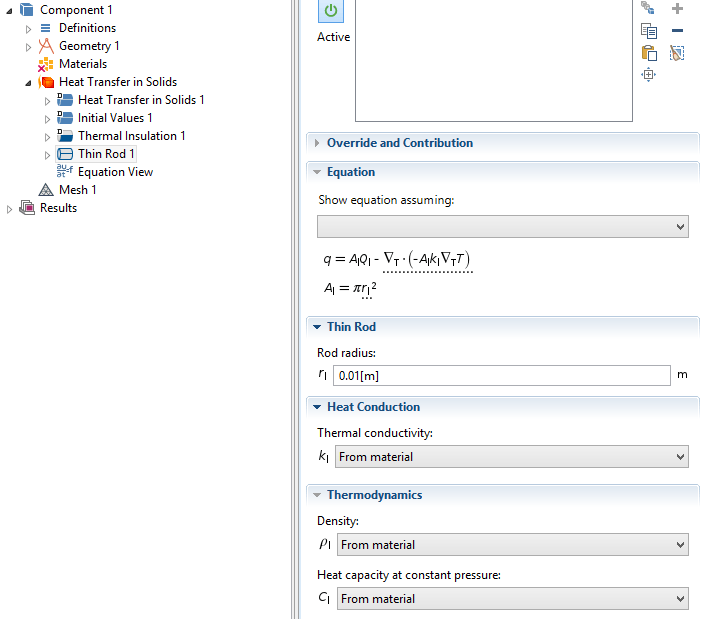 The computed value can be used in, for example, a heat transfer simulation. A new 1D Plot Type exists which allows for visualization of the individual or collective behavior of a system of particles. Particles arriving on the lower surface cause the geometry to deform. Erosion feature: While moving through a pipe elbow, sediment particles may have sufficient momentum to impact the pipe walls. The particle trajectories are plotted on the left, while the rate of erosive wear is plotted on the right. Secondary Emission on domains: Secondary emission of 300 particles which occurs when the primary particle reaches a critical energy. Improved Dielectrophoretic Force for Particles with Thin Shells: Dielectrophoretic separation of blood cells of two different sizes and physical properties. 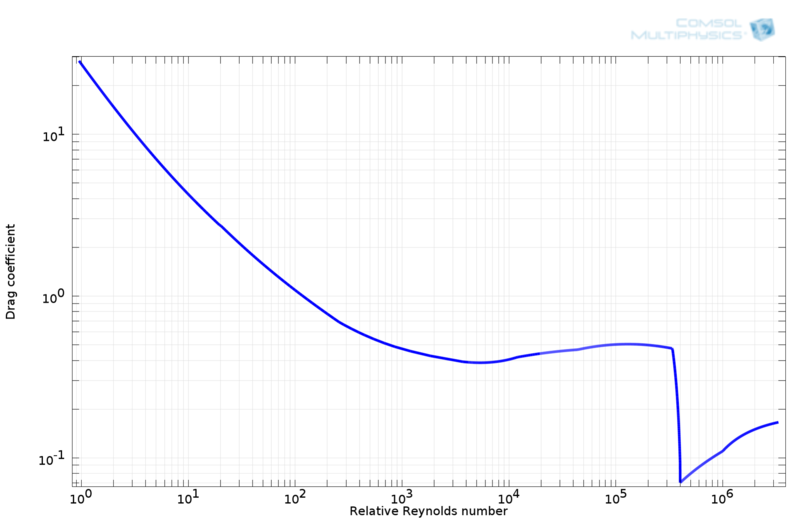 Oseen correction: An alternative to the Stokes drag law at low relative Reynolds numbers. Hadamard-Rybczynski: Useful for computing the drag force on extremely pure gas bubbles or fluid droplets. 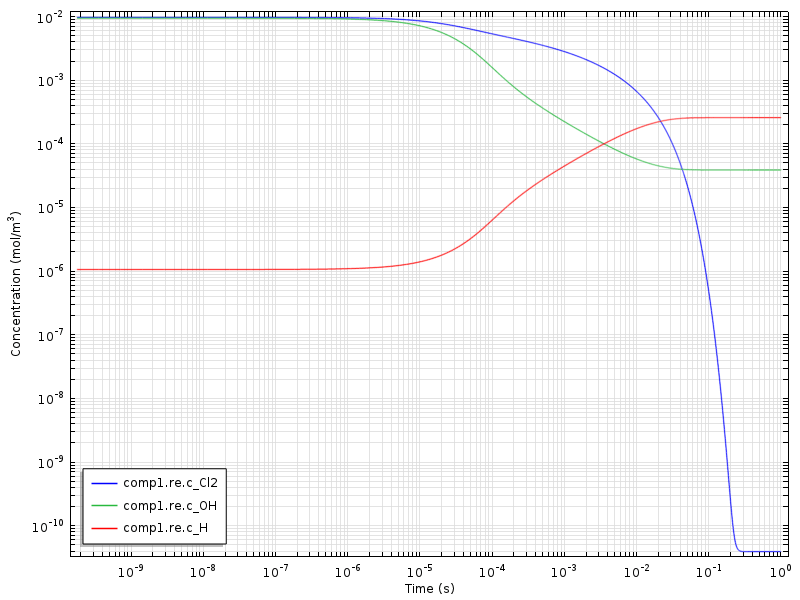 Standard drag correlations: A set of piecewise-continuous functions of the relative Reynolds number, valid over many orders of magnitude. The new Override Properties node can conveniently introduce multiple species of particle into a model, each species having different physical properties. 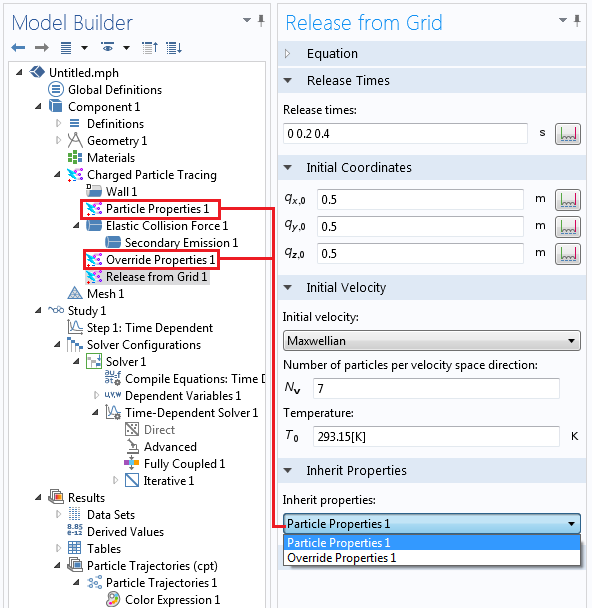 Every feature that releases particles, such as the Release, Inlet, and Secondary Emission features, has a new setting called Inherit Properties that assigns properties to the particles released by that feature. 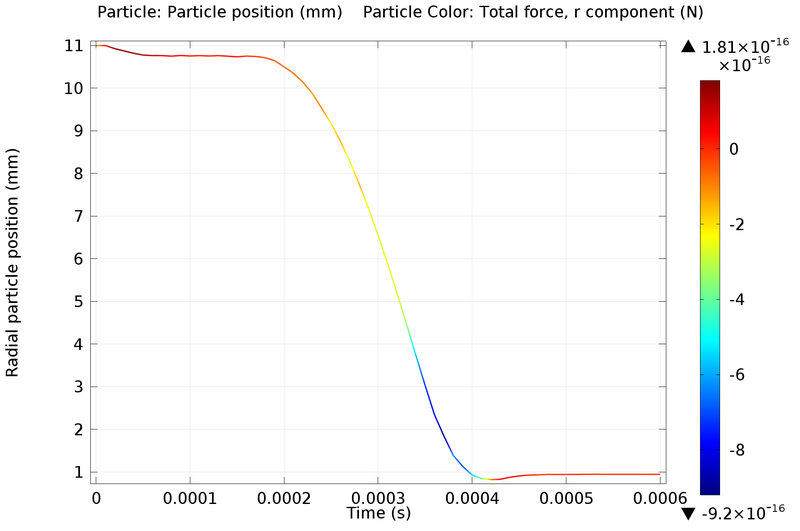 The Velocity Reinitialization feature now supports secondary emission of particles. Whenever a particle's velocity is reinitialized due to this feature, the particle can release secondary particles. In addition, the Velocity Reinitialization feature can now make the primary particle stick, freeze, or disappear, instead of reinitializing its velocity. An Etch feature is now available for the Charged Particle Tracing interface. The Etch feature can be added to any Wall or Outlet boundary condition, causing it to compute the etch rate on those boundaries. 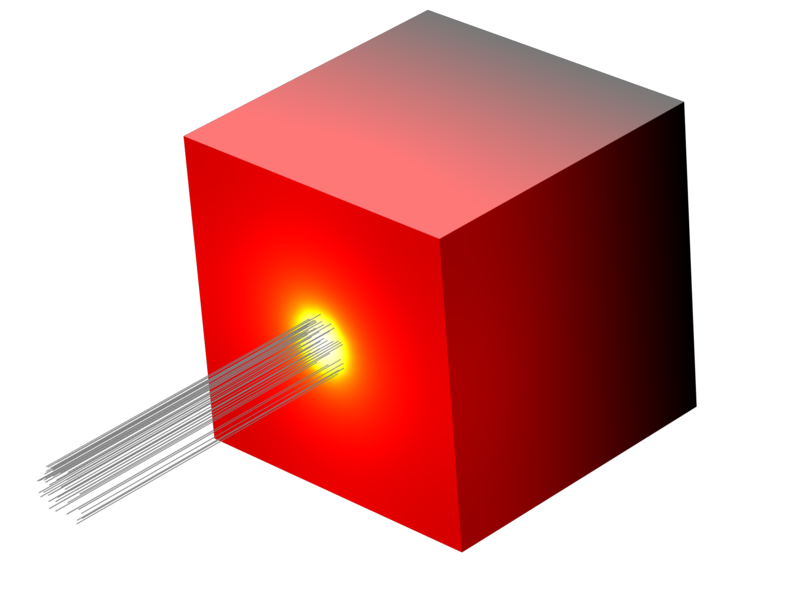 The Etch feature supports both collisional and collisionless plasmas. In the settings for the Electric Force and Magnetic Force nodes, a user-defined phase shift can now be applied to time-harmonic fields. 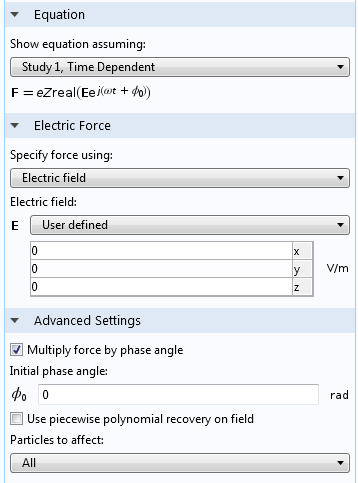 The Initial phase angle setting is available when the Multiply force by phase angle check box is selected. Basset: Applicable for near-continuum flow. Epstein: An asymptotic solution for particles in a free molecular flow. Phillips: Shares the same asymptotic behavior as the Basset and Epstein correlations, making it applicable over a wide range of Knudsen numbers. Cunningham-Millikan-Davies: includes three user-defined parameters that can be used to obtain a best-fit to empirical data. A Shell node can now be added to the Dielectrophoretic Force node. This enables more accurate calculation of the dielectrophoretic force on particles with thin outer layers, such as biological cells. The Inlet node no longer overrides the settings of Wall and Outlet nodes that share the same selection. This allows custom settings to be applied for particles that return to the inlet boundary at a later time. When older models are opened, a Wall node with the Disappear wall condition is automatically added to the Model Tree to ensure backwards compatibility. It is now possible to release particles on Inlets with a hemispherical or conical velocity distribution. Units can now be specified in the settings window for each Auxiliary Dependent Variable feature. A different unit can be assigned to each auxiliary dependent variable. In addition to points and comet tails, it is now possible to plot arrows at particle positions in the Particle Trajectories, Particle Tracing, and Particle Tracing with Mass plots. General data properties have been added for more than 40 materials. Thermal conductivity and heat capacity have been added for more than 30 materials. Fatigue data has been added for more than 10 materials. Stress rupture has been added for more than 10 materials. 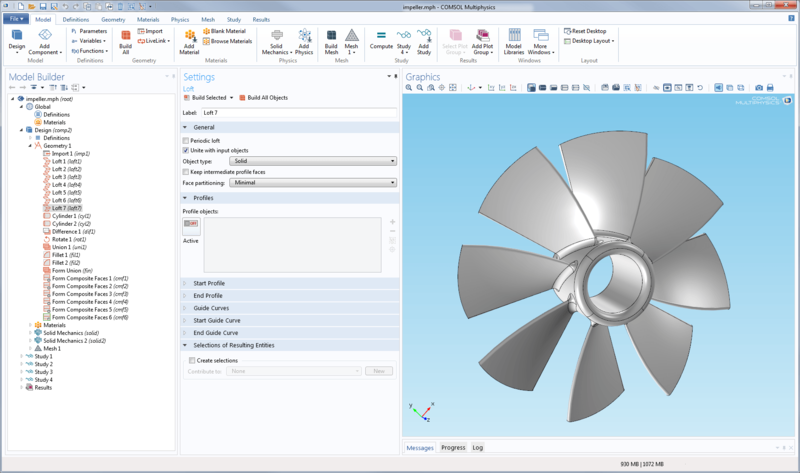 A series of lofting and fillet commands have been used to create the geometry of this impeller. 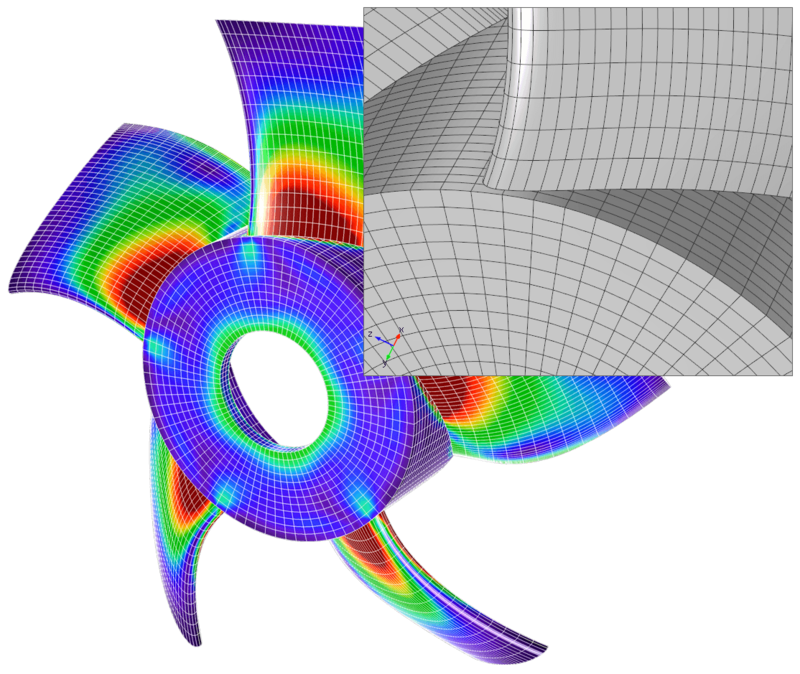 A series of lofting and fillet commands have been used to create the geometry of this impeller. A helicopter swashplate base has had its edges chamfered using the new Design Module. A helicopter swashplate base has had its edges chamfered using the new Design Module. 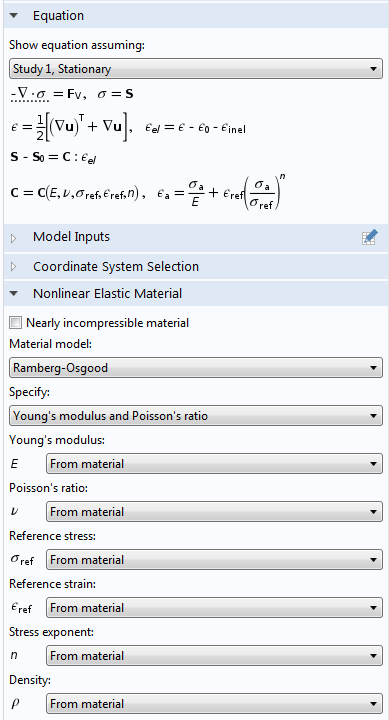 mphinterpolationfile: The new function, mphinterpolationfile, creates a file for use with the Interpolation node in a COMSOL model. It supports the grid, sectionwise, and spreadsheet formats. 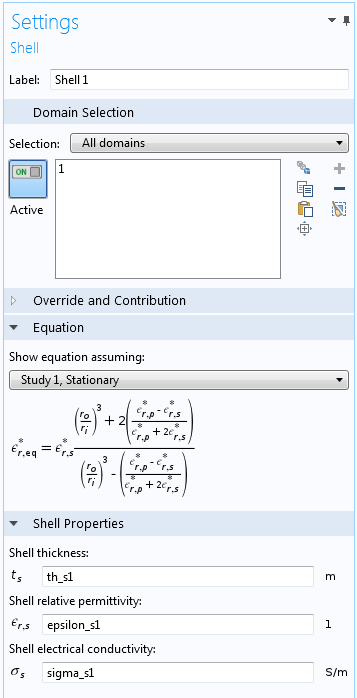 You can now access COMSOL Multiphysics functionality from Excel® macros written with Visual Basic for Applications (VBA). LiveLink™ for Excel® now supports local languages. 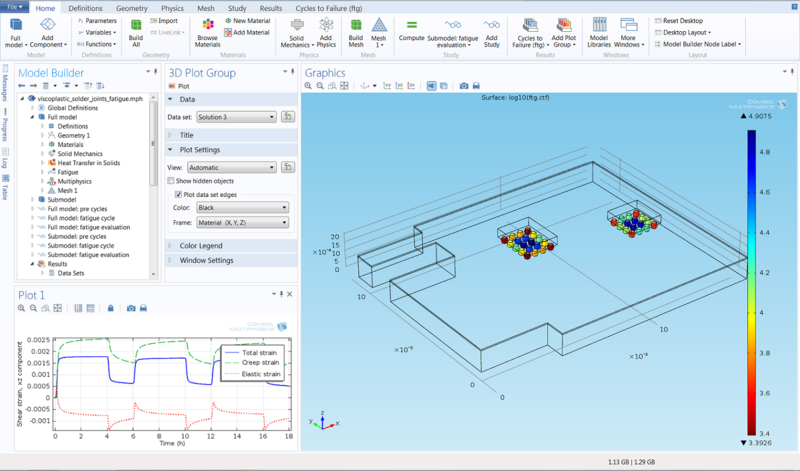 An acoustics simulation of a room, where the geometry and architectural elements have been designed in Revit®, and linked to COMSOL Multiphysics® through LiveLink™ for Revit®. 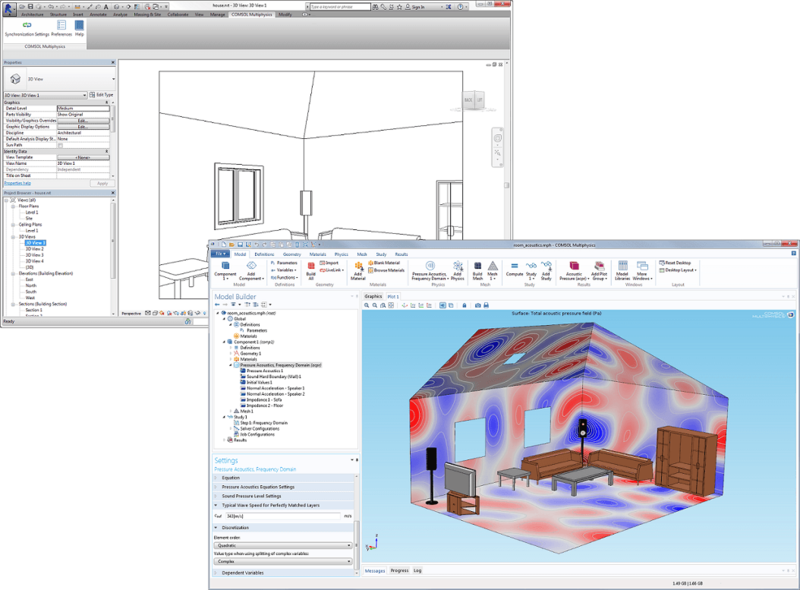 An acoustics simulation of a room, where the geometry and architectural elements have been designed in Revit®, and linked to COMSOL Multiphysics® through LiveLink™ for Revit®. Creating simulations is complex. 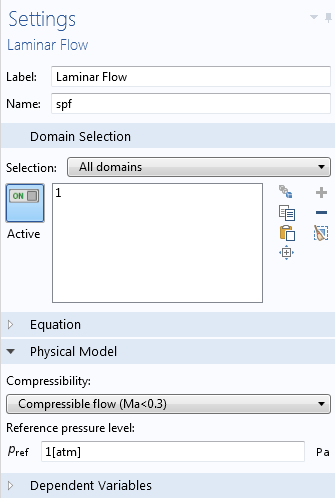 Use the Application Builder to turn your COMSOL Multiphysics model into easy-to-use apps. What would happen if you could share your COMSOL Multiphysics models with your entire organization as intuitive applications designed to meet their specific needs and purposes? Instead of running a model simulation several times as required by your colleagues, you are providing them with the ability to run their own simulations. These would only include the parameters relevant to the design of a specific device or product. Additional people utilizing simulations will lead to more improved and optimized designs and processes. Limiting the inputs and variables of a model to only those required for a project decreases the chance of human error and speeds up the simulation process. 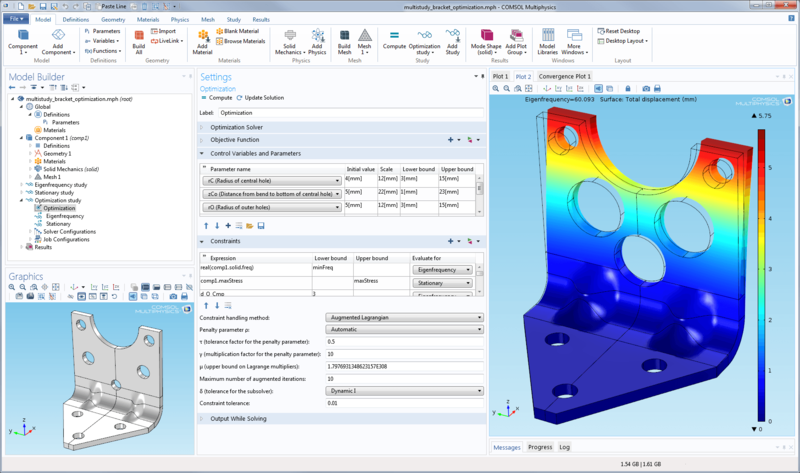 With the Application Builder, COMSOL Multiphysics users can now build applications for use by engineering and manufacturing departments, expanding accessibility to their expertise and cutting-edge simulation solutions. Now everyone will be able to directly see the impact that modeling has on their work. This video takes your through the workflow for setting up and running a specialized application. The process for building an application starts with a simple command: Save Model as Application. From here, the Application Builder will swiftly take you through the different steps for building your application, from choosing the parameters that you want to make available for manipulation in the application's user interface to the postprocessing and presentation of results most relevant to the application user. Modeling power that has traditionally been geared towards the engineering analyst or expert can now be employed by all members of your organization. 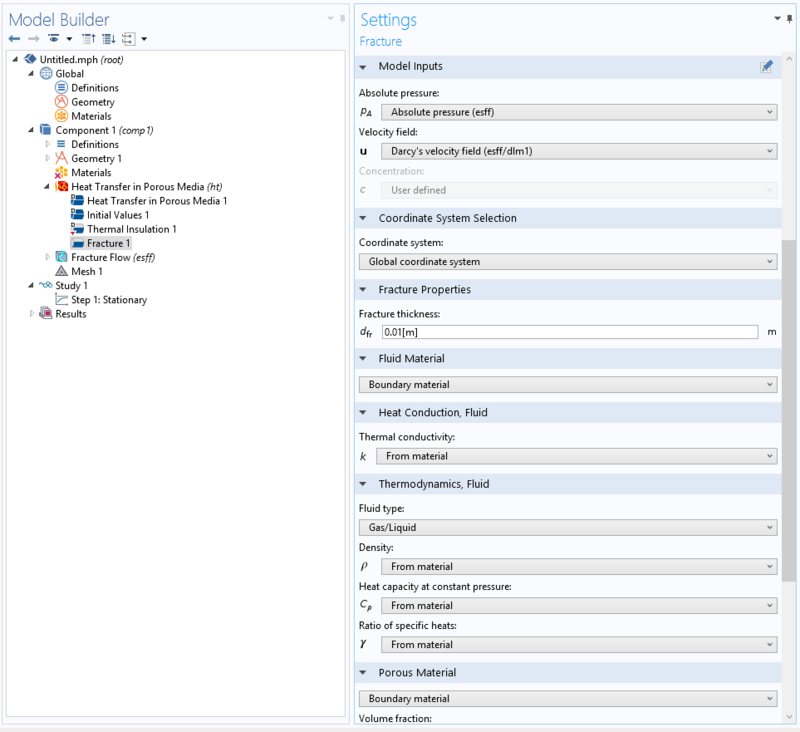 Using the Application Builder, you simply select one of your existing models to create an intuitive and specific interface in your application. An easy-to-use Form Editor creates this user interface through click and drag-and-drop operations, while a flexible Method Editor allows you to program customized commands. You control the inputs and outputs for the application and your applications can be as advanced, or as simple, as your design. 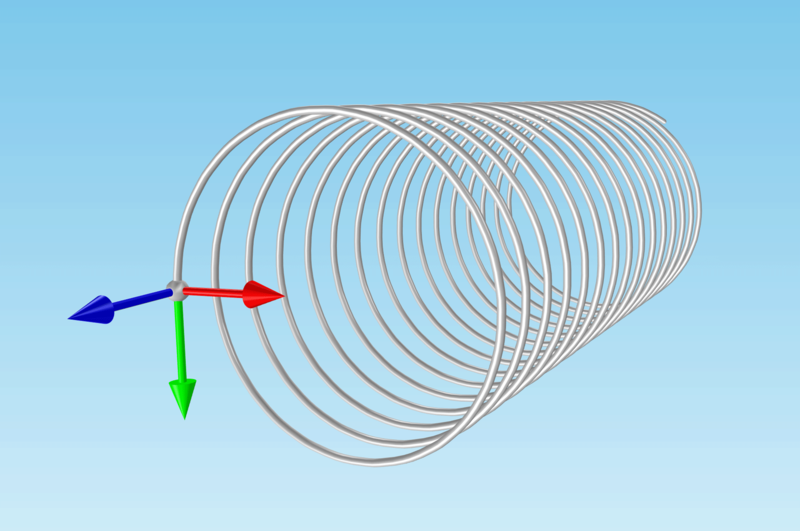 This model and application simulate the static electromagnetic field of an outward flux focusing magnetic rotor using permanent magnets, known as a Halbach rotor. 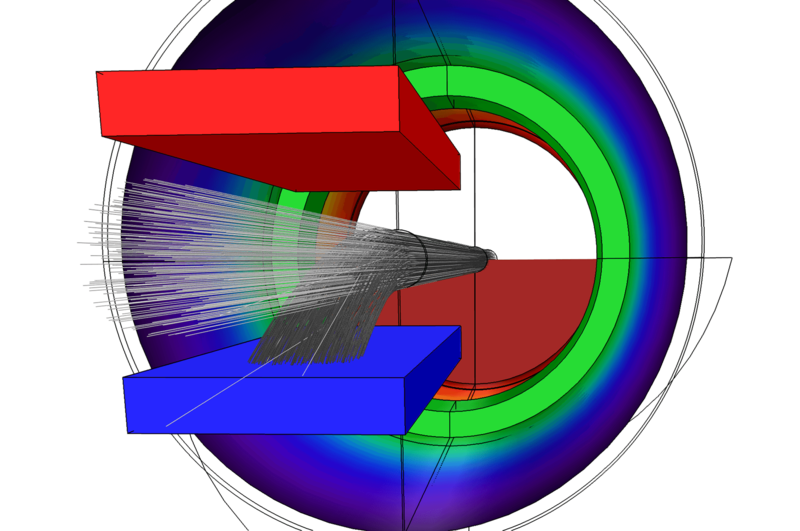 The accurate modeling of a permanent magnet's fields is important for such a device. The derived application from the model allows the engineer or technician to focus on just that one aspect. 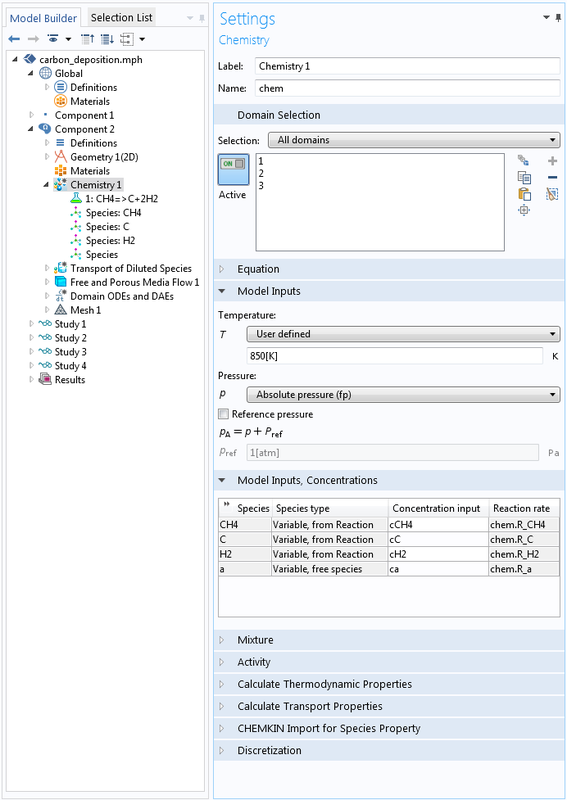 The Application Builder is included with all copies of COMSOL Multiphysics 5.0. Just download and upgrade today to get started. COMSOL Server™ is the engine for running your simulation apps and the platform for controlling their deployment and distribution. Provide simulation throughout your organization with industry-specific apps built by experts. 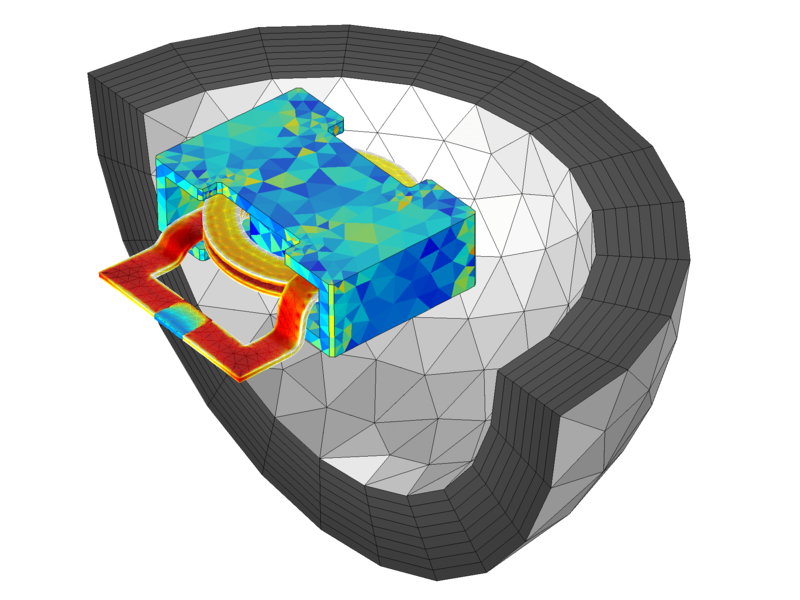 In COMSOL Multiphysics® version 5.0, industry experts can develop apps based on their models. 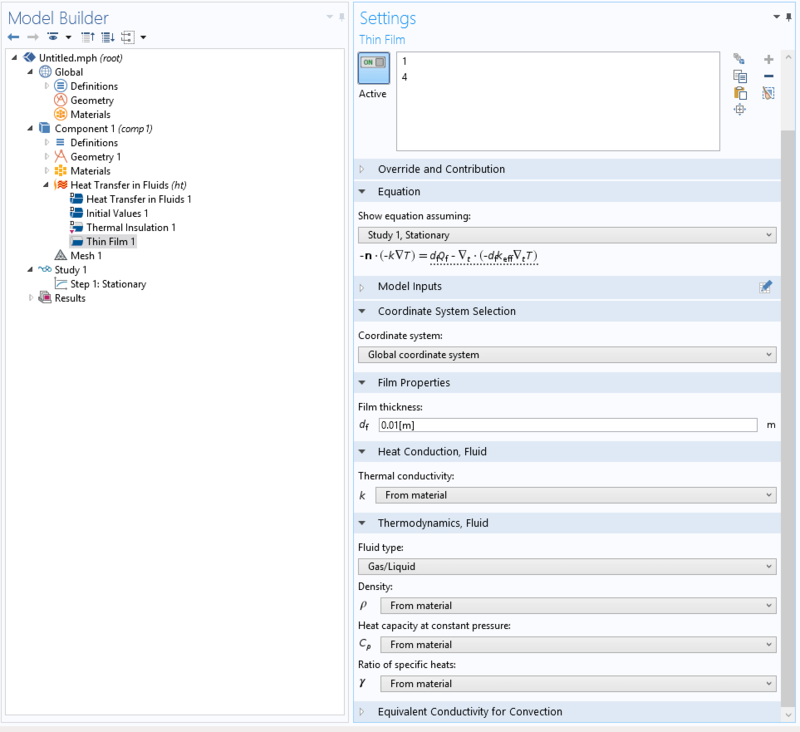 Using the Application Builder, models are given customized user interfaces, where the expert decides which inputs and outputs the end-user will require to run the simulations specific to their needs. This brings the power of simulation directly to groups throughout your organization. 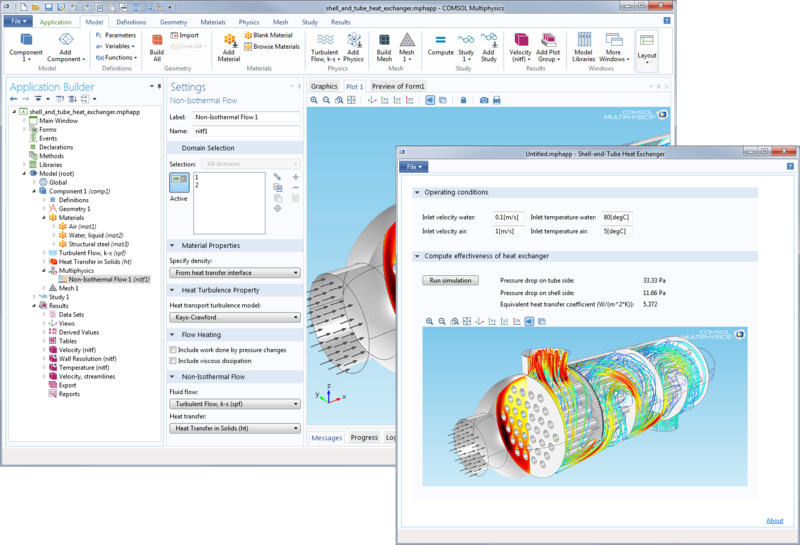 Process and product designers as well as manufacturing teams will enjoy the benefits of multiphysics modeling – even without simulation expertise. These applications can be uploaded to COMSOL Server™, then accessed and run from anywhere within your organization's worldwide structure. Flexible licensing allows your colleagues to access COMSOL Server™ and run your app from anywhere within your organization. You can even allow your customers, clients, vendors, or partners outside your organization to run your applications on your worldwide COMSOL Server™ license. Alternatively, you may host it on a Virtual Private Cloud (VPC) and use this infrastructure to control access and monetize your apps and services. 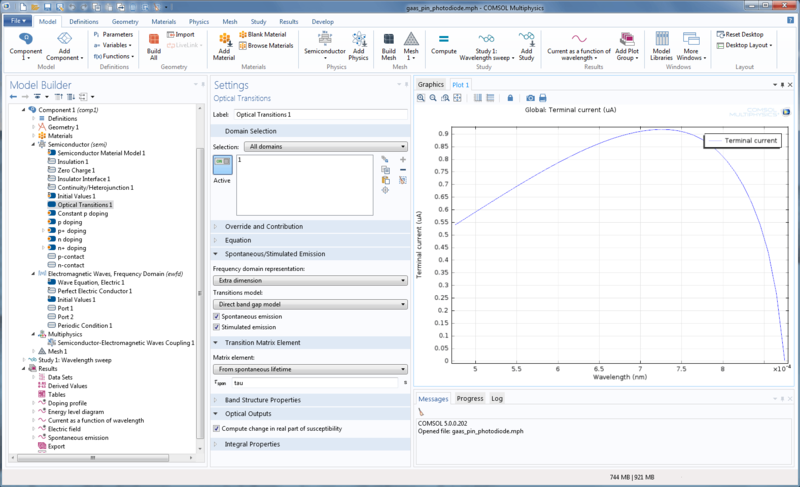 Start building your applications today by upgrading to COMSOL Multiphysics® version 5.0 with the new Application Builder. COMSOL Server™ is the future of tomorrow.